End stage arthritis of the first metatarsophalangeal joint (MTPJ) is a debilitating condition that affects thousands of patients yearly. The treatments for it has been well known and studied for many years, however, controversy still remains with the different surgical options available. 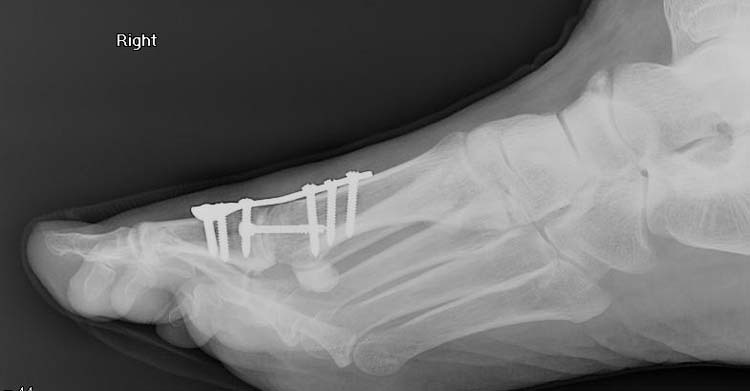 Arthrodesis has always been considered the mainstream treatment for advanced hallux rigidus, but with newer technologies and development of more functional implants, implant arthroplasty has become more popular and may someday surpass arthrodesis. The purpose of this paper is to review the two procedures and provide a literature-based comparison of the overall outcomes. Three retrospective studies with variable methods were reviewed and used to compare the two procedures and their results. Utilizing this data, it was concluded that arthrodesis produces overall superior results with better patient satisfaction and fewer complications, but has lower functionality as it does not restore the first MTPJ motion. Key words: Hallux rigidus, arthrodesis, implant arthroplasty. End stage arthritis of the first metatarsophalangeal joint is a painful condition that results in significant limitation of motion of the joint. The condition has been well documented and studied over the years, however, surgical treatment still remains controversial. There are numerous surgical options which can be categorized into joint destructive and joint sparing procedures. Our main focus is to compare arthrodesis and implant arthroplasty for the treatment of end stage hallux rigidus. There are two main causes of hallux rigidus; congenital or adult-acquired. The congenital form has an onset during the teenage years caused by an underlying structural deformity such as an abnormally long hallux proximal phalanx or a long first metatarsal. The adult acquired form typically affects patients in their 40’s or 50’s due to high impact activities such as running or dancing. Abnormal biomechanics of the foot contribute to hallux rigidus which includes excessive pronation, hypermobile first ray, or metatarsal primus elevatus. Hallux rigidus is most commonly seen bilaterally, however, it can be seen unilaterally in cases when trauma is the cause of the pathology. Other causes include neuromuscular imbalance, metabolic disorders, or post-surgical complications. Initially, the patient will present with a painful and stiff big toe joint specifically with weight-bearing forces or increased during activity. Activities that require excessive extension of the first MTPJ will exacerbate the symptoms . They will complain of pain at the first MTPJ when wearing high heeled shoes. Patients may complain of pain with certain shoes due to soft tissue irritation from rubbing of the shoe gear. 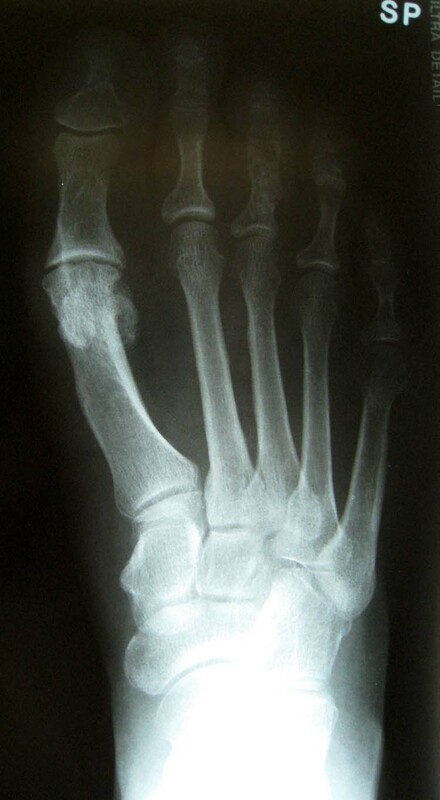 In earlier stages of the arthritis, pain will mainly be present with palpation to the dorsal aspect of the first metatarsal head with a possible palpable dorsal exostosis on physical exam. As the condition progresses, pain will be present during passive end range of motion of the metatarsophalangeal joint. With severe arthritis, there will be crepitus and pain during midrange motion of the joint. Gait alteration or compensatory changes may also cause lateral metatarsalgia . Other common clinical findings include plantar hyperkeratotic lesions specifically at the plantar aspect of the hallux IPJ. Grade I: Mild limitation of dorsiflexion, mild dorsal spurring, pain, no sesamoid involvement, subchondral sclerosis, mild sesamoid enlargement. Grade II: Broadening and flattening of the metatarsal head and base of the proximal phalanx, focal joint space narrowing, structural first ray elevatus, osteochondral defect, sesamoid hypertrophy. Grade III: Worsening loss of joint space, near ankylosis, extensive osteophyte formation, osteochondral defects, extensive sesamoid hypertrophy, with or without joint mice. Treatment for hallux rigidus can be divided into 2 groups: joint sparing versus joint destructive procedures. Joint sparing procedures include cheilectomy, first metatarsal osteotomy, and phalangeal osteotomy. Figure 1 Radiographic evaluation of hallux rigidus as described by Regnauld. Images A/B corresponds with Grade I/II Regnauld. Images C/D corresponds with Grade III. Images E/F corresponds with Grade IV. Joint destructive procedures include excisional arthroplasty, implant arthroplasty, and arthrodesis. The procedure chosen is determined by the underlying deformity or the stage of hallux rigidus. In the earlier stages, cheilectomy or a decompression osteotomy of the first metatarsal is sufficient to relieve patient symptoms. However, the patient should be made aware that hallux rigidus is a progressive disorder and further surgical intervention in the future may be necessary. For the later stages of hallux rigidus, implant arthroplasty and arthrodesis are the most viable available options. Prior to any procedure, every surgeon must take into consideration each patient’s biomechanical factors, lifestyle, age, activity level, as well as their overall short-term or long-term expectations to the surgery . Surgeons must also consider their own past outcomes as well as experience and comfort level with the types of procedures proposed . Implant arthroplasty for the first MTPJ was first introduced in the 1950’s, however, it became more mainstream in the early 1970’s when Dow Cornings’ Swanson-Silastic hemi- implant gained widespread use and acceptance . Within a few years of its use, however, various complications resulted from the implant such as reactive synovitis, fractures of the material, fibrous hyperplasia, and lymphadenitis which discredited these implant . In the late 1970’s to early 1980’s, a variety of new designs created by Swanson, LaPorta, Lawrence, Sgarlato, and Hetal aimed to eliminate these complications by creating new hinged, non-articulating silicone implants with the addition of grommets . These implants were later referred to as second generation first MTPJ implants. The 1990’s brought about different materials such as metallic hemi-implants (unipolar) or total joint implants (bipolar) which reduced the complications from the traditional silicone implants and are still used today. These newer implants are referred to as third generation first MTPJ implants . The development of these third-generation implants was a result of advancements in technologies and an improvement in the properties of silicone elastomers. . Lawrence et al published a study in March 2013 which discusses the success of these new third-generation implants in 54 patients with 70 implants having an average follow up period of 66.4 months. Patients had an average postoperative American Orthopaedic Foot and Ankle Society (AOFAS) score of 88.2 and an average VAS score of 8.5 with 10 being the highest . Very little data is published in the long term success for some of the latest designs, but technology continues to evolve with new advancements in foot and ankle orthopedic biologics being made every day. Although implants have been around since the 1950’s, they are still evolving and changing, and therefore considered investigational in the minds of some surgeons. Arthrodesis remains the gold standard surgical treatment for end stage 1st MTPJ arthritis with predicable outcomes and patient satisfaction. The procedure was first described in 1984 for the treatment of hallux valgus. Although joint functionality is decreased since the motion is completely eliminated, the procedure provides stability through the medial column for a plantigrade foot during ambulation and a stable lever arm for propulsion . Therefore, this procedure is often indicated for patients with an active lifestyle allowing them to return to their daily recreational activities without painful motion at the joint . The main focus for a successful procedure and better overall outcome is not so much the technique used but rather the position of the fusion. The sagittal plane position is determined by the normal declination of the first metatarsal relative to the floor and transverse plane position is based relative to the lesser toes . The hallux should be positioned in 10⁰ of dorsiflexion relative to the weightbearing surface and 15 to 20⁰ of abduction ensuring that the hallux does not impinge against the second toe . In addition, the frontal plane and rotational correction should be maintained in a neutral position making sure the toenail faces straight upward . Fixation is based on surgeon preference but most commonly used with the greatest success are dorsal plates or crossed cannulated screws. Non-union rates for arthrodesis range from 0-23% with union rates ranging from 91-100% . Multiple studies on arthrodesis and implant arthroplasty have been performed with sufficient long term follow-up comparing the two procedures. We reviewed three recent articles describing results from both procedures in attempts to compare outcomes of 1st MTPJ arthrodesis and implant arthroplasty. One study published in 2012 by Kim et al looked at 158 patients (105 female and 53 male). The patients had undergone one of three procedures: arthrodesis, hemi-implant or resectional arthroplasty. The patients were followed for an average of 159 weeks. Function, alignment and subjective assessment of pain were evaluated and their outcomes determined were successful procedure versus need for further intervention. Out of the 158 patients, 51 underwent arthrodesis, 52 hemi-implants and 55 resectional arthroplasty. There were three revisional surgeries performed, two with bone graft and one without. In the arthrodesis group, complications included non-union, malunion, metatarsalgia and continued first MTPJ pain. 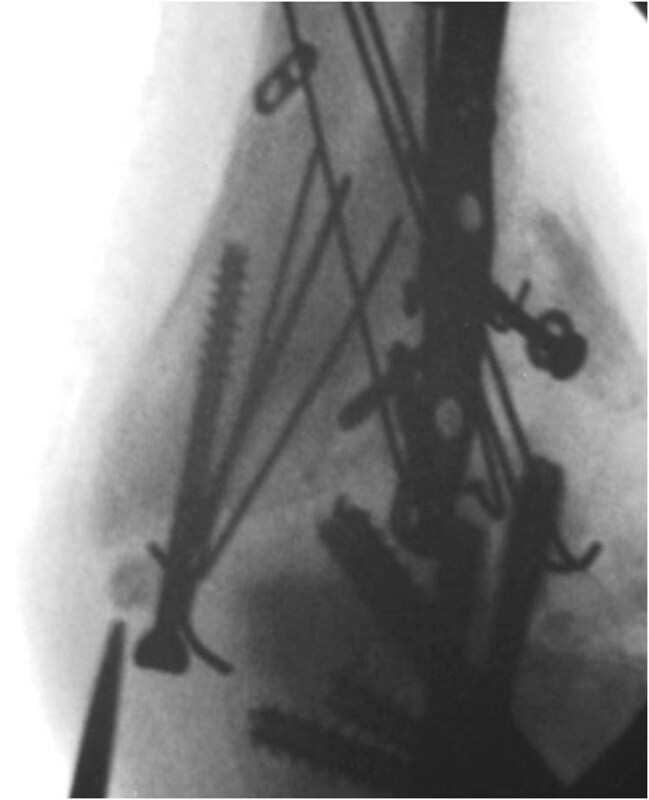 Complications in the hemi-implant category included radiolucency around the implant, bony overgrowth into the joint, migration into the joint, dorsal drift of the hallux, cystic changes to the implant, metatarsalgia, elevation of the first ray, subsidence of the implant and continued first MTPJ pain. Two revisional surgeries were performed for this category with removal of implant and resectional arthroplasty. Complications of the arthroplasty group included floating hallux, metatarsalgia, sesamoiditis and remodeling of the first metatarsal head. There were no revisional surgeries required for this group. No statistical significant difference was found when comparing the procedures for function, alignment and subjective pain with an average follow up of 3 years. A second study published by Raikin et al, in 2008 performed 21 hemi-arthroplasties and 27 arthrodesis in 46 patients. The patients were followed for an average of 79 months. The patient satisfaction rates were quantified in four categories: excellent, good, fair and poor. The outcomes for the hemiarthroplasty were excellent or good for 12 cases, fair in two cases and poor or failed in seven. The mean pains score level was 2.4 out of 10. There were five hemiarthroplasties that failed, four were revised into arthrodesis and one into revisional hemiarthroplasty. The fusion rate was 100% for the 27 arthrodesis and no revisional surgery was required. The patients were followed for a mean of 30 months and the outcomes for the arthrodesis group was twenty-two excellent or good, four fair, and one poor. The mean pain score level was 0.7 out of 10. The most recent study conducted by Erdil et al, published in 2013 reviewed 38 patients who had a total joint replacement, hemiarthroplasty or arthrodesis and were followed for at least two years. Out of the 38 cases, 12 were total joint replacement (group A), 14 were hemiarthroplasties (Group B) and 12 were arthrodesis (Group C). Complications of the procedures included one superficial soft tissue infection (Group A), One non-displaced first metatarsal fracture due to non-compliance (Group A), metatarsalgia (Two in group A, Two in group B and Three in group C) and delayed union. There were no major complications that required revisional surgical intervention and were resolved with conservative treatment. 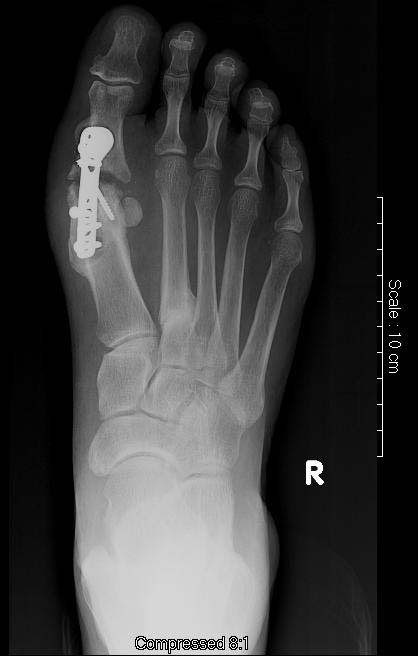 Functional outcomes were evaluated using American Orthopaedic Foot and Ankle Society-Hallux metatarsophalangeal interphalangeal (AOFAS-HMI) scale and Visual analog scale (VAS). With regards to AOFAS-HMI score there was no significant difference between groups A and B. Group C had a significantly lower AOFAS-HMI score which was expected due to the lack of range of motion. With regards to the VAS score there was also no significance between groups A and B. The VAS score was also decreased in group C.
First metatarsophalangeal joint implant arthroplasty versus arthrodesis in hallux rigidus is a controversial topic and most often depends on each individual case presentation. The studies mentioned above cover multiple methods to quantify each procedure. The first study focused on function, alignment and subjective pain. The second looked at patient satisfaction, and the third study looked at orthopaedic functionality and scoring post surgically. This variety allows us to best analyze the outcomes of each procedure. The first study by Kim et al. indicated similar long term overall patient satisfaction with both arthrodesis and hemi-implant. The arthrodesis had the least amount of complications and revisional surgical intervention needed but this did not affect the final results as there was no statistical significance in the patient subjective scores. In the study by Raikin et al. where patient satisfaction and pain level were evaluated, arthrodesis supersedes hemiarthroplasty. There were fewer complications with arthrodesis as seen in the other two studies. The study by Erdil et al. also revealed that fewer complications were seen in the arthrodesis group, although the biomechanical functionality is decreased. The total joint and hemiarthroplasties were also successful procedures in this study so they suggested that arthrodesis be considered a salvage procedure if functionality needs to be preserved. In conclusion, arthrodesis in cases of advanced hallux rigidus is the most successful and reliable procedure when every criteria is taken into consideration. Besides low functionality and maintaining the integrity of the joint, it provides fewer overall complications, lower revisional rates, and higher patient satisfaction. Nonetheless, hemi-arthroplasty and total joint replacement are also viable options that need to be considered in every case, specifically for patients that are less active and wish to maintain their first MTPJ motion. Diabetic patients usually have multiple comorbidities resulting in higher complication rates after ankle fractures. In many cases, the patient, through diabetic complications of peripheral neuropathy, may mistakenly ambulate resulting in dislocation or hardware failure if only internal fixation is utilized. Also, impaired wound healing, infection, non-union, mal-union and development of Charcot foot and ankle arthropathy may ensue. This article will present several cases in which open reduction and internal fixation in diabetic ankle fractures failed which then lead to osteomyelitis. 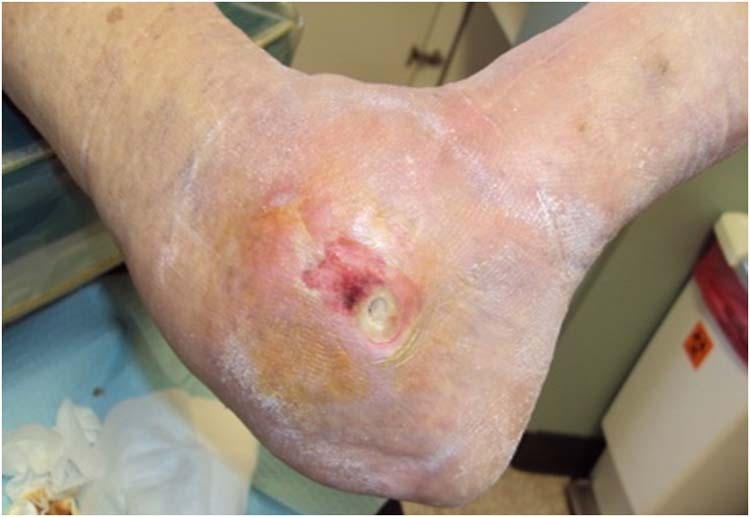 This infection with the presence of diabetic neuropathy results in an increased risk for loss of limb. 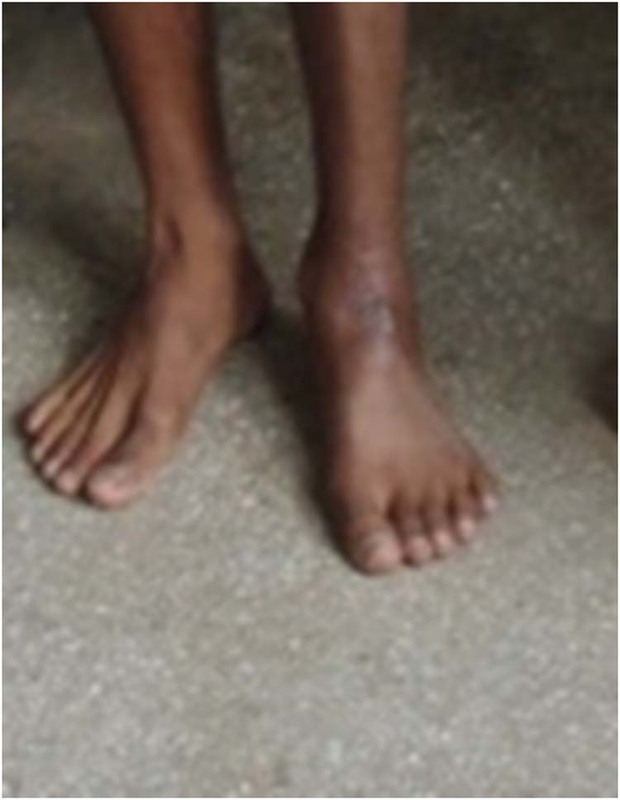 These cases were ultimately salvaged with septic ankle arthrodesis using the Ilizarov Method. Key words: Diabetic ankle fracture, osteomyelitis, Limb Salvage, Septic Ankle Arthrodesis, Ilizarov Methodology. Treating diabetic ankle fractures is a very complex task and many times lead to multiple complications. The majority of diabetic patients have comorbidities such as peripheral vascular disease, osteoporosis with poor bone stock that can lead to poor healing potential and complications. A few of the complications encountered are ulcerations and wound dehiscence. 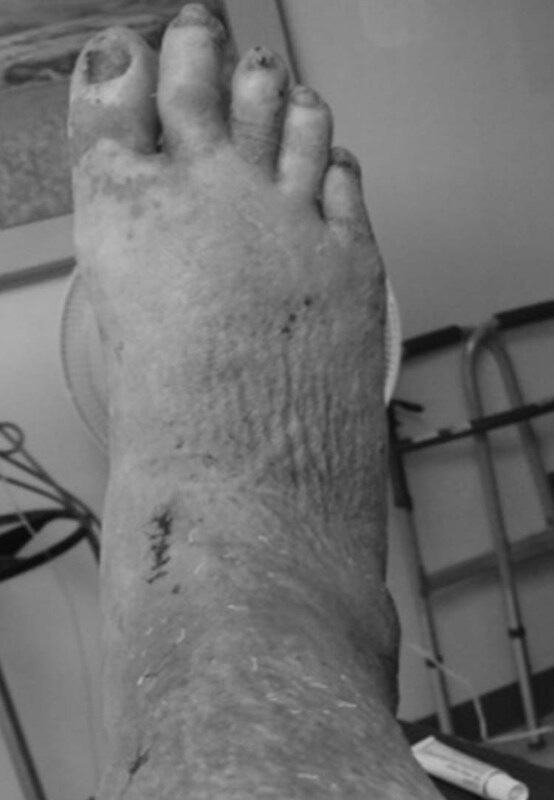 It has been well documented in the literature that diabetic patients with ankle fractures who underwent open reduction and internal fixation developed complications of wound infections, below the knee amputations, Charcot arthropathy, malunions, wound necrosis requiring plastic surgery, and deep sepsis. 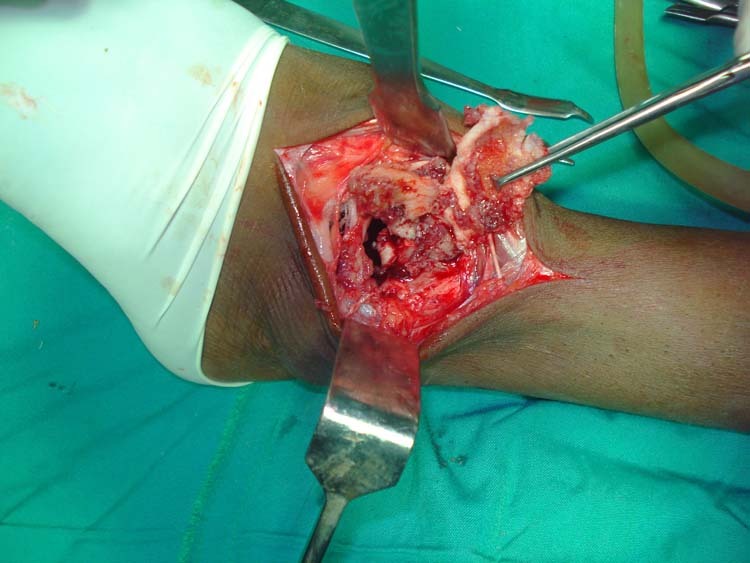 [1,2] When complications are encountered, often, salvage is managed by ankle arthrodesis. Our treatment protocol is to fuse the ankle using the Ilizarov Method. When performing an ankle fusion there are a variety of different open surgical approaches to exposing the ankle for fusion as well as arthroscopic ankle fusions. The open surgical approaches are more commonly used than the arthroscopic option. Of the many different open approaches the more common ones are the medial transmalleolar, lateral transmalleolar, anterior, and posterior approaches. A discussion on the various types of ankle arthodesis will be presented followed by the Ilizarov Method in septic ankle joint arthrodesis. In the lateral approach of ankle arthrodesis, an osteotomy is performed approximately 2 cm proximal to the level of the ankle joint. In this approach care must be taken not to sever the sural nerve. [3,4,5,6] The lateral approach is preferred over an anterior approach in cases with moderate to severe deformity. Therefore in cases where a severe deformity of the ankle joint is not present, an anterior approach is indicated. In regards with the anterior approach, care is taken to avoid any damage to the terminal branches of the superficial peroneal nerve, the intermediate and the medial dorsal cutaneous nerves due to the course of these nerves under the incision site. The fixation indicated for the anterior approach is composed of at least 2 screws inserted at 30 degrees with respect to the long axis of the tibia. These screws should cross proximal to the fusion site to maximize stability. In certain cases a third screw can be placed to improve sagittal plane stability. A major advantage of the anterior approach is that the osteotomy of the lateral and medial malleoli is avoided. The other approach which is used but is not discussed in the literature as frequently is the posterior approach. Regardless of whether an open or an arthroscopic fusion is performed, the position of the foot for fusion is the same. In the literature the correct position for fusion is valgus of the posterior foot varying from 0 to 5 degrees with an external rotation of 5 to 10 degrees, sloping slightly posterior talus relative to tibia and neutral flexion position. [1,2,4,5,6] In order to prevent malposition, the foot should be compared to the rest of the leg and the contralateral limb before fusing it. In difficult cases of ankle arthrodesis and limb salvage the preferred fixation methods are Intramedullary (IM) nail and external fixation. 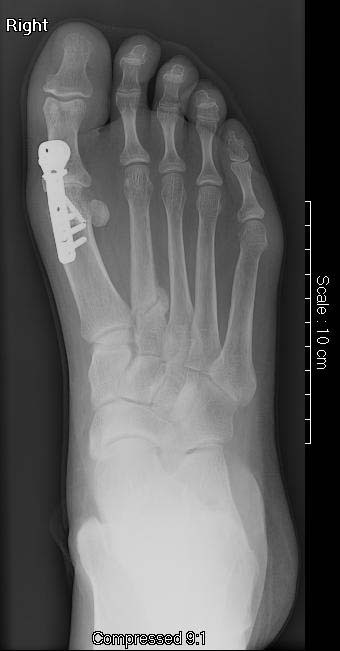 [1,4,5,10,11] Obtaining a solid fusion can be challenging in compromised bony interfaces, and standard techniques of tibiotalar ﬁxation such as crossed lag screws are often inadequate. An advantage that the Ilizarov technique has over IM nailing and the other internal fixation options is it can be used in cases of infection. [3,4] The Ilizarov method also spares the subtalar joint. As discussed earlier, complications include malposition, neurovascular complications. Nonunions and amputations can also occur as a complication depending on the surgical approach. Initially they can be treated with prolonged periods of immobilization and minimal weightbearing. In addition, an external bone stimulator can be used. If prolonged immobilization does not help then bone grafting and external fixation are recommended. [1,4,5,11,13,14,15] In cases in which non unions are painful and they are not able to be resolved with repeated surgical options an amputation is many times the only option. [11,13] Also superﬁcial infection of the surgical incision or the pin sites in external ﬁxation methods has been reported as occurring in 40% to 50% in which local wound care is usually sufficient enough. In cases of deeper infections where osteomyelitis is involved the rate of amputation is as high as 50% which happens more so in the case of fusions performed in an existing septic process. 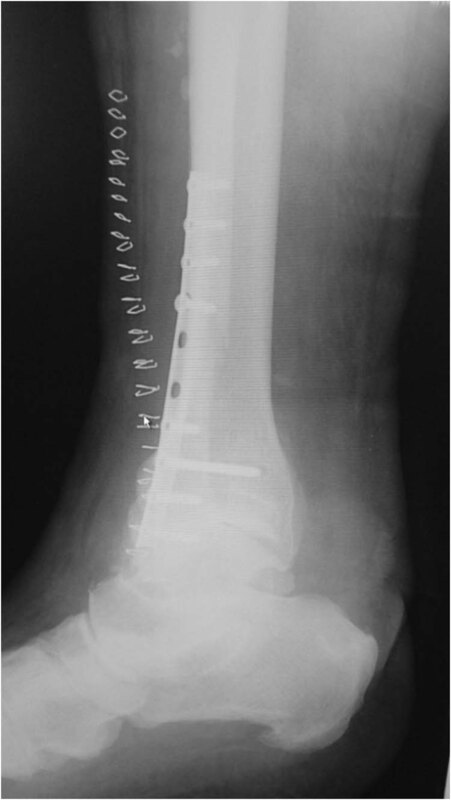 This article will present failed open reduction internal fixation (ORIF) in diabetic patients that were salvaged in case of septic ankle fusion using the Ilizarov method in which both medial and lateral incisions were used. 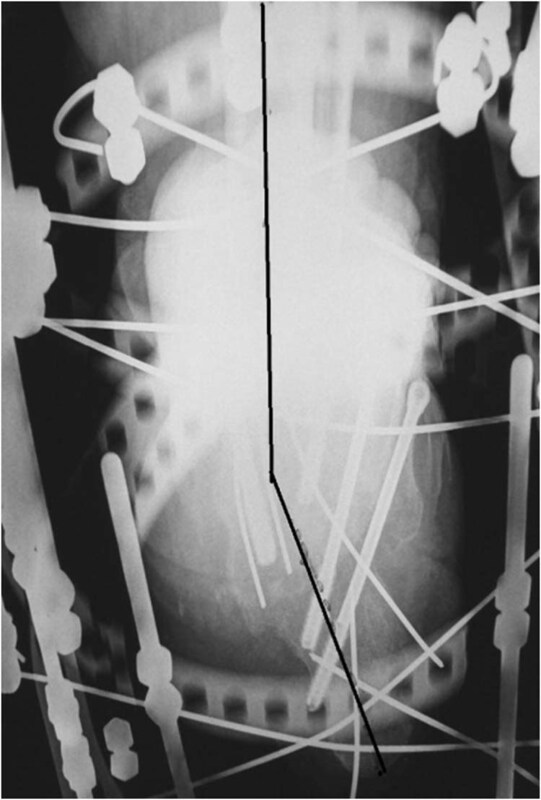 Figure 1 Pre-operative radiograph of failed internal fixation in case #1. 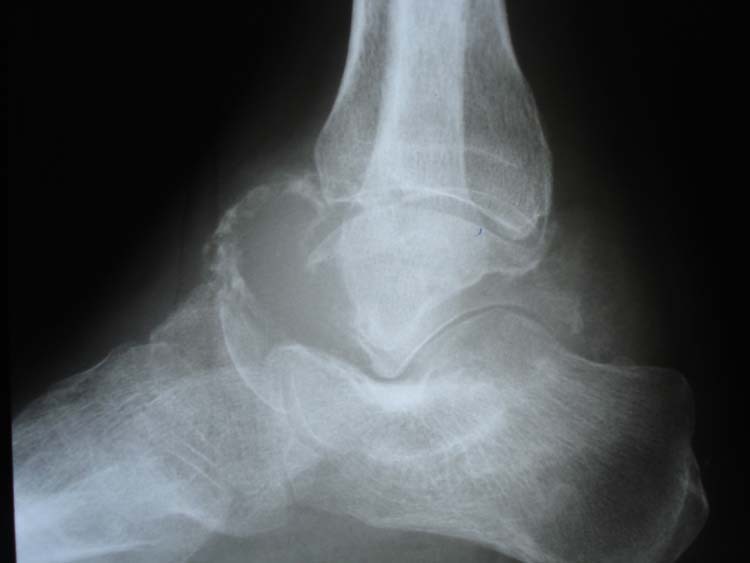 Figure 2 Clinical photograph of the exposed distal tibia and calcaneus in case # 1. 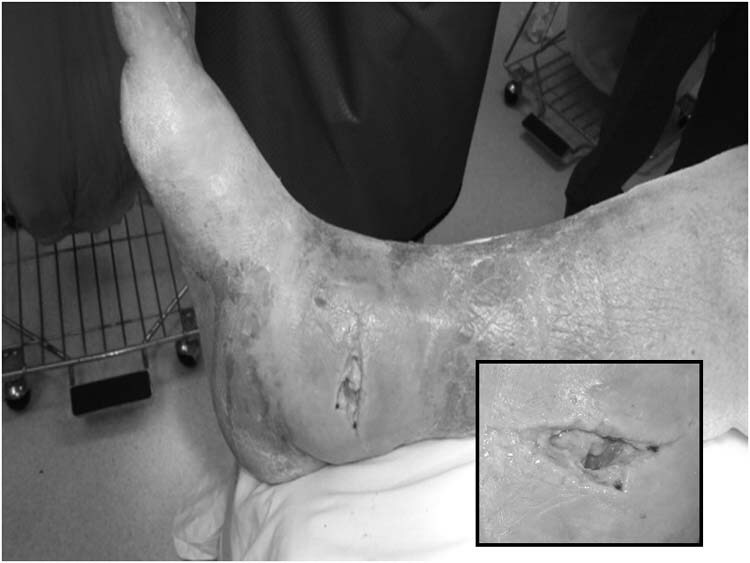 Figure 3 Application of the external fixator, closure of the calcaneal ulcer with a Graft Jacket, and rotational flap to cover the tibial wound at the ankle in case #1. Figure 4 Showing lateral approach in case #1 with the external fixator. The anteroposterior radiograph (A), Lateral radiograph (B) and lateral radiograph after removal of wires from the subtalar joint (C) in case # 1. All radiographs showing complete consolidation of the tibial talar joint. 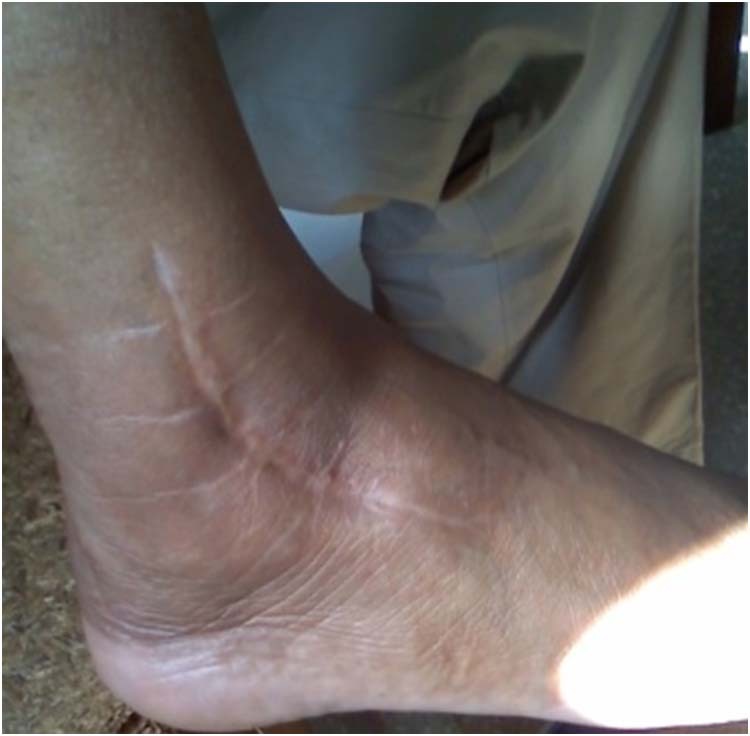 Figure 5 Clinical photographs 4 months after surgery showing limb salvage with all wound healed with solid bone consolidation in case #1. This patient is a 380lb, diabetic, neuropathic, cardiomyopathic patient with a malunion. (Fig. 6) He had an unstable ankle fracture at the fibula with complete rupture of the deltoid ligament. (Fig. 7A and 7B) He was stabilized with open reduction and internal fixation. He ambulated several days after the surgery resulting in malunion and widening of the tibial talar joint. He was seen by our service several months after the initial surgery. He had a large open wound down to the medial tibia with purulent drainage coming from the ankle joint. 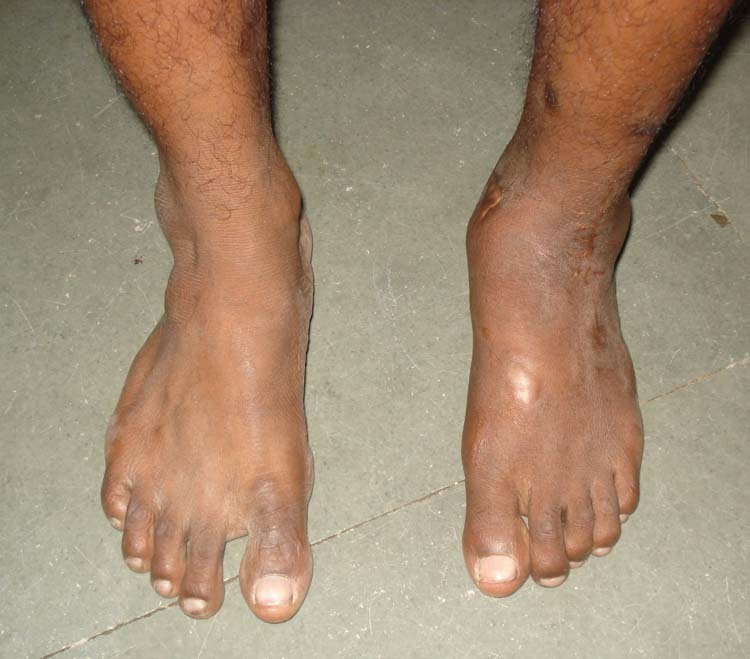 He presented with osteomyelitis of the ankle. Again, he was cleared for limb salvage. 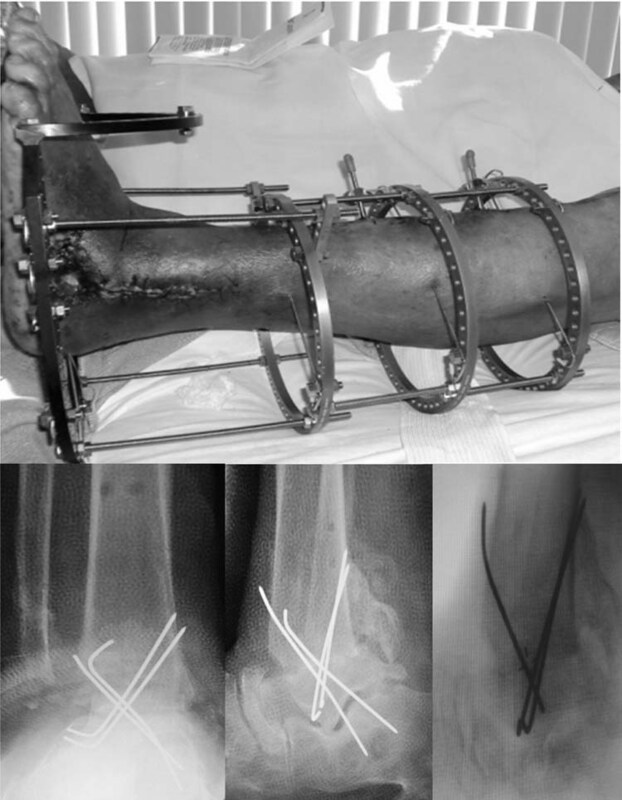 Figure 8A and 8B Clinical photographs of septic ankle arthrodesis using the Ilizarov frame. Medial view: Note closure of the ankle using a rotational flap (A) and anterior view. This is the second day after surgery for case #2. Figure 9A and 9B Lateral (A) and anteroposterior (B) radiographic views 2 days after surgery showing ankle and subtalar joint arthrodesis compressed with an Ilizarov circular external fixator in case # 2. Figure 10A and 10B Medial (A) and lateral (B) views 3 months after tibial-talar-calcaneal fusion with the Ilizarov frame. The skin on the medial side has completely healed with the rotational flap in case # 2. Figure 11 The ulcer has completely healed and the Ilizarov external fixator has been removed in case #2. The foot is very stable and completely fused at the tibial-talar-calcaneal joint. 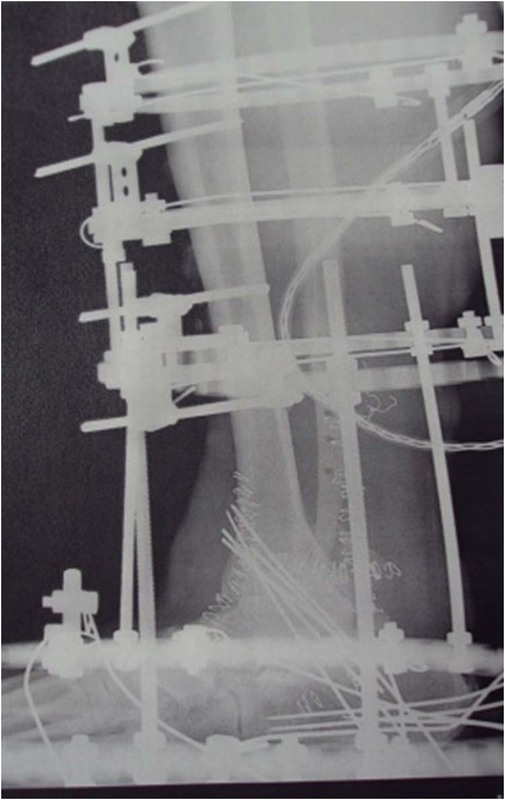 Figures 12 Post operative radiographs showing complete arthrodesis of the tibial-talar-calcaneal joint and stabilization using percutaneous 6.5 mm fusion Synthes bolts after the Ilizarov frame was removed in case #2. Figure 14A and 14B Severe foot and ankle deformity with sepsis at the tibial talar joint and failed hardware. 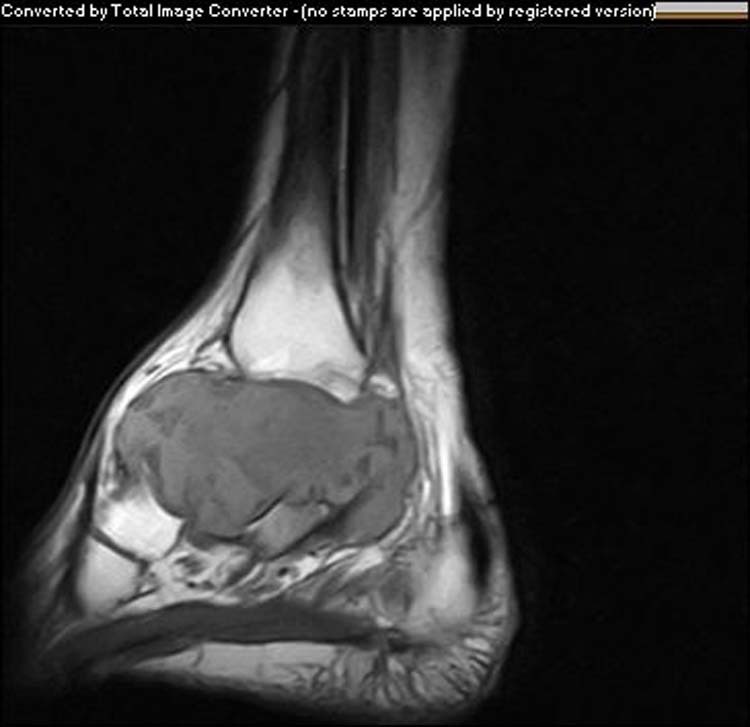 (A) Note the probe in the medial ankle. (B) Putrid smelling brown pus was noted coming from the medial ankle and tracking across the ankle to the lateral mid leg area in case #3. Rods were then applied to the foot plate and tibial rings. Compression was applied in an axial direction. There was good alignment and good compression. Another incision was made above the ulcer and a full thickness rotational flap was performed to close the ulcer where the tibia was exposed. There were also two other ulcers noted which were created by the prior transfixation screw through the calcaneus. These ulcers were debrided to good bleeding tissue and then covered with Graft Jacket and sutured with 3-0 ProleneTM. The rest of the surgical sites were closed using 3-0 VicrylTM for deep tissue and 3-0 ProleneTM for the skin as well as skin staples. 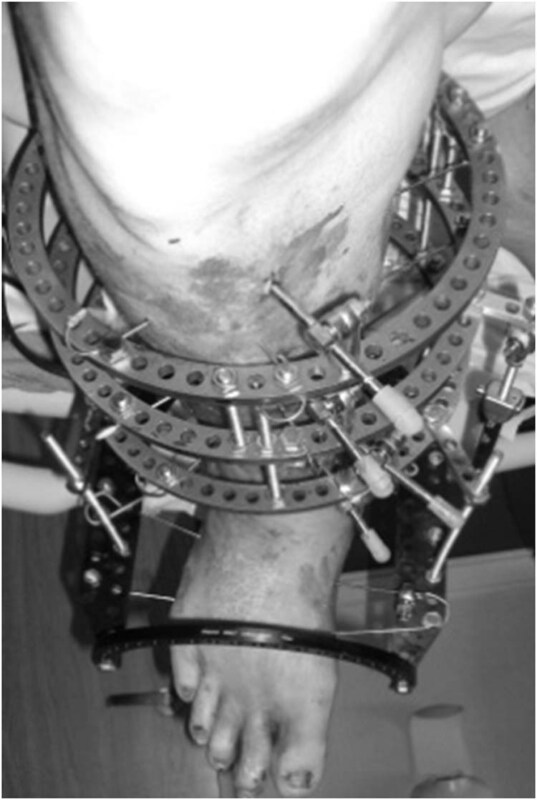 Case # 2: Three 200 mm tibial rings were applied to the patient proximal to the open wound on the lower leg. Then 1.8 mm smooth wires were inserted and tensioned appropriately. Then 4 tibial half pins were inserted into the tibia and attached to the tibial rings. Then a foot plate was applied to the foot with wires and tensioned appropriately. The tibial rings and the foot plate were not connected. Then an incision was made on the medial and lateral ankle. All the necrotic bone, tissue and the hardware were then removed. The tibia and the talus were then resected to good bleeding tissue and good apposition. The lateral incision was also extended to the subtalar joint and the subtalar joint was then denuded of cartilage. The large ulcer on the medial side was debrided and all necrotic tissue was removed. There was an even larger opening on the medial side after the debridement. The surgical site was irrigated with 3 liters of normal saline with bacitracin. The foot plate with the foot was then manipulated in a manner in which the tibia and second toe was in line. The tibial talar joint was in neutral position without varus or valgus. There was no varus, valgus, dorsiflexion or plantar flexion noted. The tibial talar joint was in neutral position. The foot plate is used to move the foot such that the talus is directly under the tibia and not forward or behind the tibia. Then several 0.062 Kirschner wires were inserted from the calcaneus, through the talus and then into the tibia. Rods were then used to connect the foot plate to the tibial rings and this was then compressed to fuse the tibial-talar-calcaneal joint. Attention was then directed to the medial large ulcer. Another incision was made at the ulcer and a rotational flap was performed so as to close the ulcer. The surgical site was closed with 3-0 vicryl for the deep tissue, and 3-0 ProleneTM and skin staples for the skin. The external fixator was left in place for three months until good consolidation was noted. The K wires were removed. 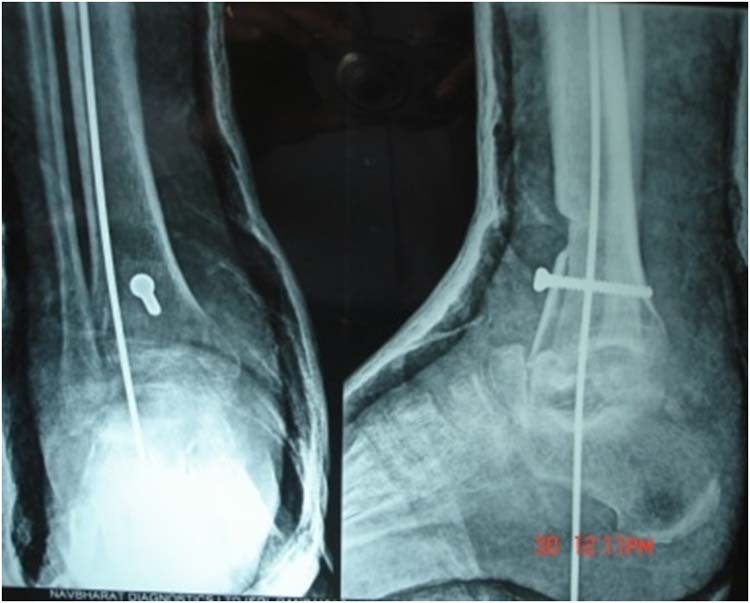 Because he was morbidly obese, internal splinting with percutaneous 6.5 bolt screws from Synthes were inserted from plantar calcaneus to the tibia. He was also given custom AFO. (Figs. 8A,8B, 9A, 9B, 10A, 10B, 11 and 12) At six month and one year follow-up, the patient is still ambulating and without any recurrence. Case # 3: The patient had severe abscess at the medial left ankle with the pus tracking laterally up the leg. (Fig. 13) An incision and drainage was performed on the medial and lateral ankle. The infected tissue, bone and hardware were all removed as well at the distal fibula. The surgical site was irrigated copiously with three liters of normal saline and bacitracin using a pulse lavage system. The surgical site was loosely approximated with 3-0 ProleneTM and skin staples. She then had wound care every day including the use of Betadine® soaked iodoform as well as irrigation with one liter of normal saline and bacitracin for 5 days. Once the infection was controlled, she was then taken back to the OR for a septic ankle arthrodesis. The patient was taken back to the OR and three 180 mm tibial rings were applied to the left lower leg proximal to the infected area. (Fig. 15) The wires were tensioned appropriately and then 2 half pins were applied. Then a foot plate was applied and tensioned appropriately. The tibial talar joint was then resected and then placed in a neutral position without any varus or valgus. There was no varus, valgus, dorsiflexion or plantar flexion noted at the tibial talar joint. Also note that the foot plate is used to move the foot such that the talus is directly under the tibia and not forward or behind the tibia. Her tibial talar joint was in neutral position. This was then stabilized with several 0.062 K wires. The foot plate with the foot was then connected to the tibial rings with several rods. These were then tightened to compress the tibial talar joint. She did have a valgus tilt of the subtalar joint with the heel being laterally located. (Figs. 16A and 16B) Because of the complexity of the deformity, it was decided to perform a medial calcaneal slide osteotomy at a different time until there was complete consolidation of the tibial talar joint. Antibiotic beads of 1 gm of Vancomycin were made and inserted into the lower leg ankle area. Two months later, the wires in the calcaneus were removed and a custom Arizona brace was dispensed and she was able to ambulate with a walker. Figures 18 Two years after surgery, the radiographs show good alignment and complete arthrodesis of the tibial-talar-calcaneal bones. The wires in the posterior calcaneus have all been removed in case #3. Figure 19 Complete healing of the calcaneal osteotomy in anatomic good position after removal of the internal fixation wires in case #3.
very minimal to no internal fixation. If the patient is severely medically compromised, the surgery was performed under IV sedation using a popliteal block, common peroneal block at the neck of the fibula and saphenous nerve block at the level of the tibial tuberosity. The previous cases of diabetic ankle fractures which were fixed with open reduction and internal fixation went on to septic ankle joints. Septic ankle joint is a difficult condition to treat with two viable options limb salvage ankle arthrodesis or below knee amputation. Patients must be aware that ankle arthrodesis may still end up in a BKA. 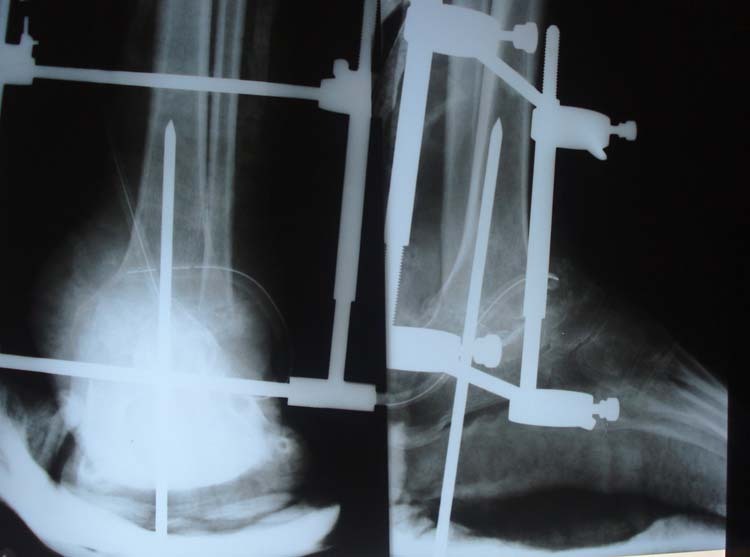 Many different ankle arthrodesis surgical techniques exist with the salvage option. Each surgeon has his or her preference as to their procedure of choice with each having their advantages and disadvantages. The author’s systematic approach to diabetic ankle fractures is to cast if they are non-displaced, and ORIF with an Ilizarov frame if ankle fracture is displaced. If they go on to a septic ankle joint then the area is debrided and internal hardware is removed and an Ilizarov method is used for ankle arthrodesis. In the authors experience the biggest complication with the Ilizarov frame is pin tract irritations and or infections but these are easily treated by removing the pin and placing a new one. The Ilizarov method is a good option in providing adequate compression and in allowing the patient to bear weight. It is important to follow these patients frequently to make sure the arthrodesis site is healing well and free of infections to prevent a BKA. 1. 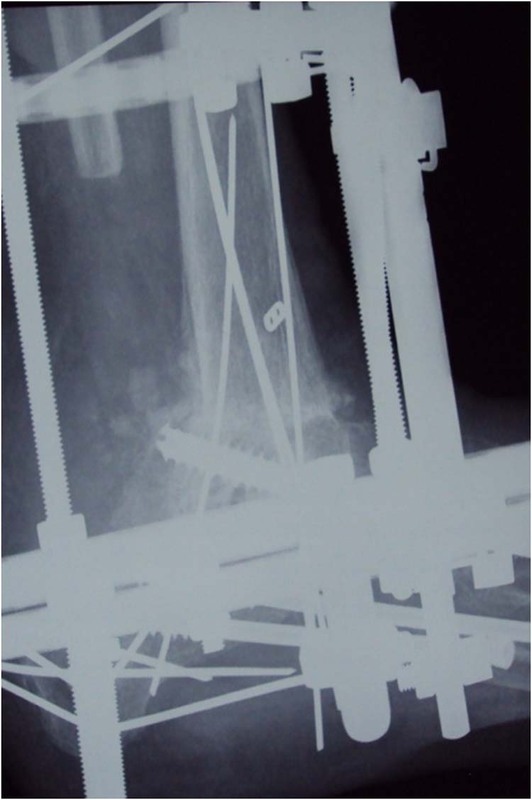 Salem KH, Kinzl L, Schmelz A. Ankle arthrodesis using Ilizarov ring fixators: A review of 22 cases. Foot & Ankle International 2006 27:764-70. 2. Klouche S, El-Masri F, Graff W, Mamoudy P. Arthrodesis with internal fixation of the infected ankle. J Foot & Ankle Surgery 2011 50: 25-30. 3. Schuberth J, Cheung C, Rush S, Blitz N, Roling B. 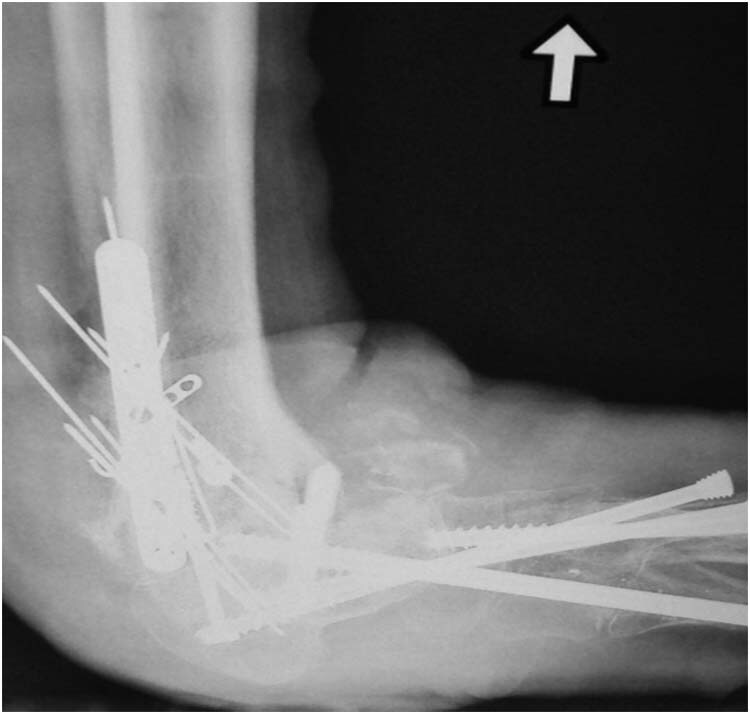 The medial malleolar approach for arthrodesis of the ankle: A report of 13 cases. J of Foot & Ankle Surgery 2005 44:125-132. 4. Easley M. Operative Techniques in Foot and Ankle Surgery. Philadelphia: Lippincott Williams & Wilkins 2011. 5. Coughlin M, Mann R, Saltzman C: Surgery of the Foot and Ankle. Philadelphia. Mosby 2007. 6. Grass R, Rammelt S, Biewener A, Zwipp H: Arthrodesis of the ankle Joint” Clinics Podiatric Medicine Surgery 2004 21:161-178. 7. Karl-Heinz K, Hans-Jörg T, Fusszentrum W. Ankle arthrodesis with an anterior approach. Techniques Foot Ankle Surgery 2007 6: 243-248. 8. Hanson TW, Cracchiolo A 3rd: The use of a 95 degree blade plate and a posterior approach to achieve tibiotalocalcaneal arthrodesis. Foot Ankle International 2002 23:704-710. 9. Glick J, Morgan C, Myerson M, Sampson T, Mann J. Ankle arthrodesis an arthroscopic method: Long-term follow-up of 34 Cases. Arthroscopy 1996 12: 428-434. 10. 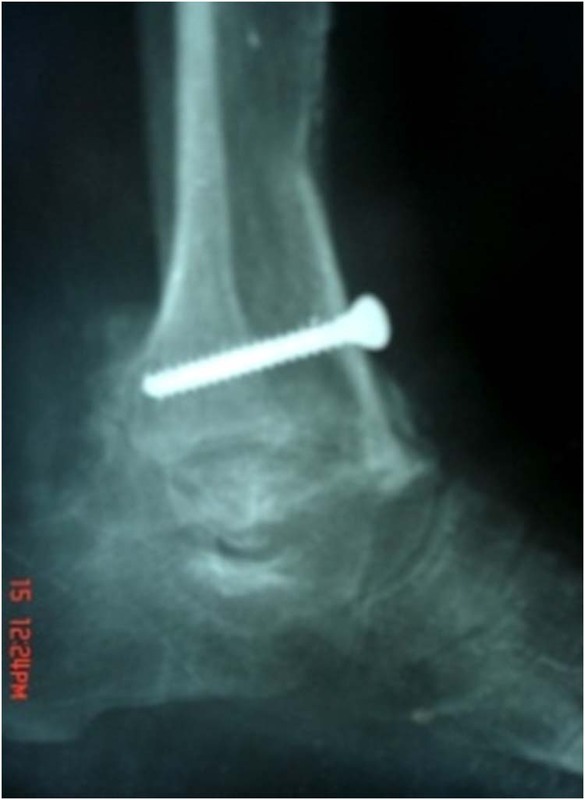 Fragomen AT, Fragomen AT, Meyers KN, Davis N, Shu H, Wright T, Rozbruch SR. A biomechanical comparison of micromotion after ankle fusion using 2 fixation techniques: Intramedullary arthrodesis nail or Ilizarov external fixator. Foot & Ankle International 2008 29: 334-341. 11. 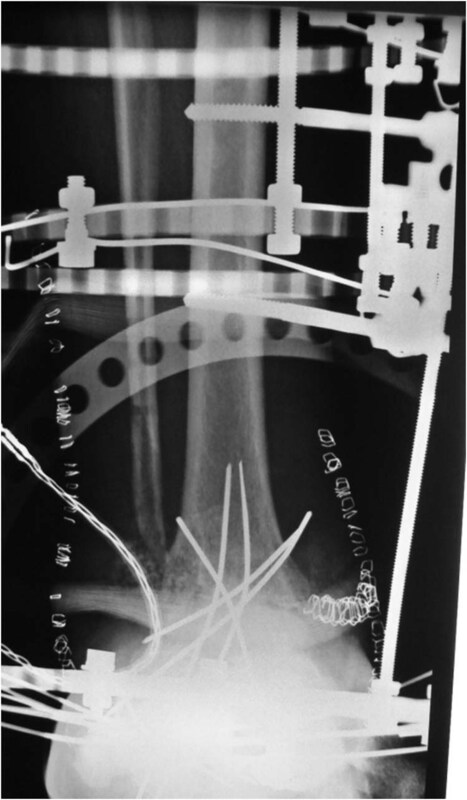 Raikin S, Venkat R. An approach to the failed ankle arthrodesis. Foot Ankle Clinics 2008 13:401-416. 12. O’Brien T, Hart T, Shereff M, Stone J, Johnson J. Open versus arthroscopic ankle arthrodesis A comparative study. Foot Ankle International 1999 20: 368-373. 13. Hagen RJ. Ankle arthrodesis: problems and pitfalls. Clinical Orthopaedics and Related Research. 1986 202: 152-162. 14. 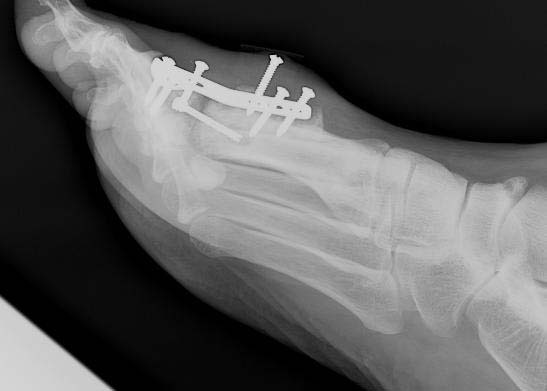 Katsenis D, Bhave A, Paley D. Treatment of malunion and nonunion at the site of an ankle fusion with the Ilizarov apparatus. JBJS 2005 87A: 302–309. 15. Morgan CD, Henke JA, Bailey RW, Kaufer H. Long-term results of tibiotalar arthrodesis. JBJS 1985 67A: 546–550. 16. Costigan W, Thordarson D, Debnath U. Operative management of ankle fractures in patients with diabetes mellitus. Foot & Ankle International 2007 28: 32-37. 17. Jones KB, Maiers-Yelden KA, Marsh JL, Zimmerman MB, Estin M, Saltzman CL. Ankle fractures in patients with diabetes mellitus. JBJS 2005 87B: 489-495. 18. McCormack R.G., Leith J.M. : Ankle fractures in diabetics: Complications of Surgical Management. JBJS1998 80B: 689-692. 19. Wukich D, Joseph A, Ryan M, Ramirez C, Irrgang JJ. Outcomes of ankle fractures in patients with uncomplicated versus complicated diabetes. Foot & Ankle International 2011 32:120-30. 20. Kline AJ, Gruen GS, Pape HC, Tarkin IS, Irrgang JJ, Wukich DK. Early complications following the operative treatment of pilon fractures with and without diabetes. Foot & Ankle International 2009 30:1042-1047. 21. Thordarson, D: Ankle fractures in diabetics. Techniques in Foot and Ankle Surgery. 2004 3: 192-197. 22. Eylon S, Porat S, Bor N, Leibner E. Outcome of Ilizarov ankle arthrodesis. Foot & Ankle International. 2007 28: 873-879. Address correspondence to: Sutpal Singh, DPM. FACFAS, FAPWCA, Chief Ilizarov Surgical Instructor at Doctors Hospital, West Covina, California. 1 Chief Ilizarov Surgical Instructor at Doctors Hospital, West Covina, California. Private practice in Southern California. 4,5 Residents, Doctors of Podiatric Medicine (R1). All residents : Doctors Hospital of West Covina (PM&S-36). Purpose: Arthrodesis of the first metatarsophalangeal joint (MTPJ) is a predictable procedure to relieve pain and dysfunction of the first MTPJ. Many fixation techniques have been described. The authors present two cases in which a locking plate was successfully used for first MTPJ fusion. The patients began immediate weight-bearing post-operatively without a delay in union, hardware failure, or malalignment. Methods: A retrospective chart and radiographic review of a 53 year-old male and a 59 year-old female was performed. 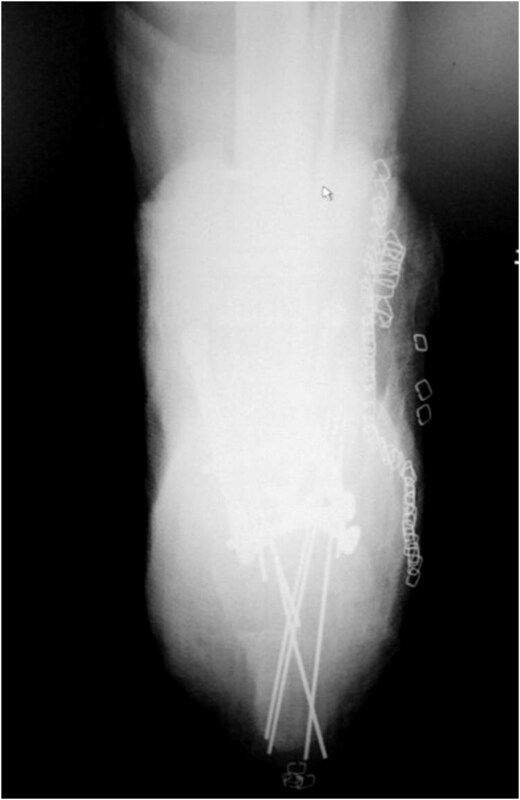 Serial radiograph was taken to assess fusion at the arthrodesis site. Procedures: Cartilage was resected from the head of the first metatarsal and base of the proximal phalanx preserving the curvature of the joint. The joint was placed in the desired position and interfragmental compression was obtained using a cannulated 4.0-millimeter partially threaded screw from proximal medial to distal lateral with all threads crossed the fusion site. A locking plate was then placed on the dorsal aspect of the joint and secured with locking screws proximal and distal. Results: The patients began ambulating immediately post-operatively with a post-operative shoe. Both patients had successful fusion by 8 weeks with good alignment and intact fixation. Patients returned to regular shoe gear once trabeculation was noted. Conclusion: These 2 case reports suggest excellent results and immediate ambulation with compression screws and locking plates. This clinical report shows promise in regards to early ambulation using locking plate fixation technique and further studies are encouraged. Key words: Arthrodesis, first metatarsophalangeal joint, MTPJ fusion, locking plate. Protocols for post-operative ambulation have varied throughout the literature, and there have been numerous reports of early weight-bearing with favorable union rates, albeit most of these studies reported patients ambulating in a rigid post-op shoe or short leg walking cast that eliminated the propulsive phase of gait.2,9-12 To our knowledge, there are currently no reported cases evaluating the use of locking plates for first MTPJ fusion. The purpose of this report is to examine results with immediate ambulation after first MTPJ with compression screws and locking plates. A 59 year-old female presented to the foot and ankle clinic with severe pain to the right first MTPJ. She had undergone an Austin bunionectomy previously, and now presented with severely limited and painful joint range of motion. Radiographs were consistent with asymmetric joint space narrowing and degenerative joint disease. (Fig. 1) The patient was informed of the risk, benefits and complications of both the procedure and the new post-operative protocol. Post-operatively, the patient was placed in a surgical shoe and instructed to ambulate as tolerated. 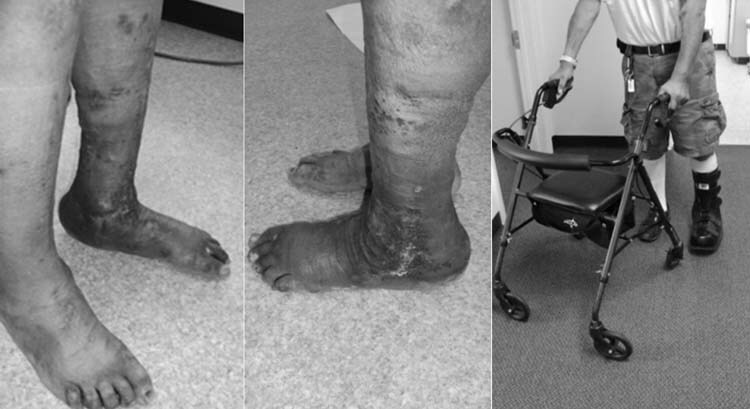 Eight weeks after surgery, the patient presented in normal shoe gear and pain free ambulation. Radiographs showed trabeculation, excellent alignment and intact fixation. A dorsal medial incision was made and layered dissection was continued down to the level of the joint. (Fig. 3) Cartilage was resected from the head of the first metatarsal and base of the proximal phalanx preserving the curvature of the joint using a cup and cone reamer. (Fig. 4) The joint was placed in the desired position (slight dorsiflexion and abduction) and interfragmental compression was obtained using a 4.0-millimeter partially threaded cannulated screw. The screw was placed from proximal medial to distal lateral being sure that all threads crossed the joint. (Fig. 5) The alignment of the joint and position of the screw was directly visualized using intra-operative fluoroscopy. The locking plate was placed on the dorsal aspect of the joint and secured with locking screws proximal and distal. (Fig. 6) The wound is closed in layers and a dressing is applied. Figure 3 A dorsal medial approach is made which allows reaming of the proximal phalanx and first metatarsal head. Figure 6 Dorsal plating of the joint provides rigid fixation of the fusion site. Patients are placed in a post-operative shoe and instructed to ambulate as tolerated. Patients are transitioned to normal footwear once clinical and radiographic signs of healing are appreciated. Many fixation techniques have been described for first MTPJ arthrodesis. [2-4,6-8,13] The ideal fixation technique for MTPJ arthrodesis should maintain stability and position of the fusion site while osseous union occurs. Each specimen was loaded to failure in a cantilever fashion and an extensometer was used to measure gapping across the arthrodesis site, with failure defined as a 2-mm gap. 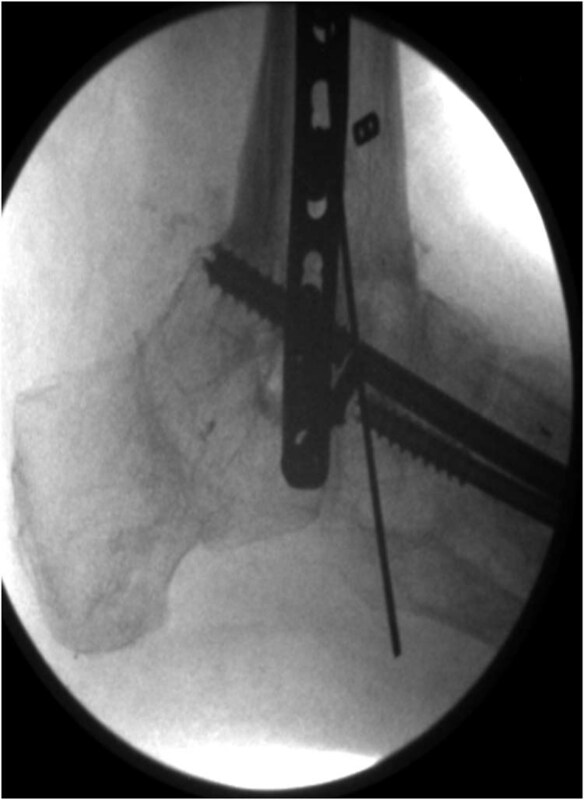 They found that the crossed cannulated screws and the dorsal plate constructs failed at significantly higher loads than the two compression staples (p<0.029 and p<0.002, respectively). The dorsal plate failed due to bending of the plate in 79% of specimens. 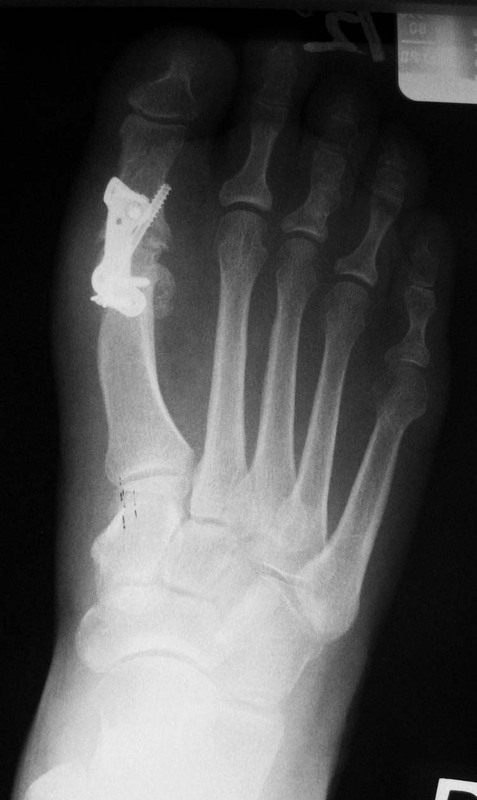 While the crossed cannulated screws provided the greatest amount of rigidity, failure occurred when the screw fractured the metatarsal head at the screw-bone interface in all but one specimen. There are several problems with conventional plate application. The stability of a plate relies on compression between the plate and the cortical bone, potentially disrupting the periosteal blood supply and inducing porosity of the bone. To apply a screw to a conventional plate, it must be tightened with an axial traction of 1000-2000 Newtons (N), which produces up to 2400 N of friction in a 4-hole plate (co-efficient of friction between metal and bone = 0.4). In addition, plate application to the first MTPJ is fraught with biomechanical disadvantages. The AO (Arbeitsgemeinschaft für Osteosynthesefragen) group recommends that a plate be positioned on the tension side of a bone to create dynamic compression in accordance with the tension band principle.1 In a loaded first MTPJ, the tension side is the convex plantar surface of the joint. Due to the position of the sesamoids, soft tissue structures, and potential complications of plantar incisions, the ideal placement of the plate on the tension side of the joint is not feasible, and the plate must be placed on the concave dorsal or compression side of the joint. Since the plate thus applied cannot supply tension band fixation, it will instead serve a neutralization function to protect the lag screw from shearing, bending, and torsional forces. 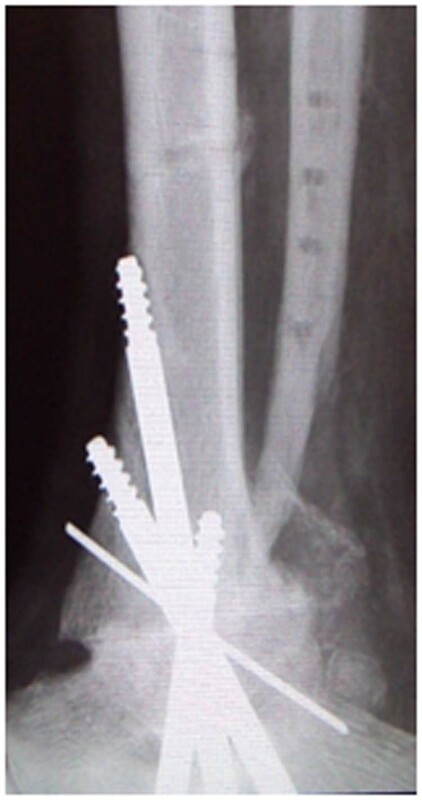 The locking plate design overcomes several of the disadvantages of conventional plate fixation and when combined with the use of an interfragmentary lag screw for compression, may provide a construct sufficiently stable to allow early weight-bearing and successful arthrodesis. The screw holes of the locking plate have threads that match the conically threaded undersurface of the screw heads, locking the screw head to the plate and negating the need for the plate to be compressed against the bone, thus minimizing the potential for disruption of the periosteal blood supply. [18,20] The locking mechanism between the screw and the plate prevents toggle and screw back out which may result from micromotion of up to 90% body weight that could be transferred onto the first MTPJ during gait. In addition, the locking properties of the plate and screws render failure impossible unless there is simultaneous pullout of all the screws. 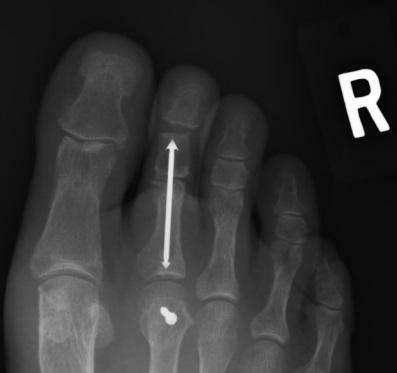 Gallentine and colleagues reported the use of locking plate fixation of proximal metatarsal chevron osteotomies, finding that the locking plate was successful in maintaining alignment and position of the first ray in patients who were allowed to bear weight on their heel immediately postoperatively. In a study of synthetic calcaneal fracture models, the stability of plates with locking screws and conventional plates without locking screws was compared. It was shown that the locking plates provided greater stability than the conventional plates with high cyclic loading simulating full weight-bearing. In an in-vitro study of first metatarsocuneiform arthrodesis, Cohen, et al., argued that one of the shortcomings of the locking plate is that while it is rigid at the screw to plate to bone interface, it provides no compression at the arthrodesis site. The authors of the current case report assert that the addition of the interfragmentary screw at the fusion site allows for compression, obviating the need for compression by the biomechanically disadvantaged plate. In this way, the plate functions to neutralize weight-bearing forces, while avoiding the aforementioned failure at the screw-bone interface by the intrinsic properties of the locking mechanism. In a retrospective review of 47 first MTPJ arthrodeses, Dayton reported a 100% fusion rate when allowing immediate post-operative ambulation with a standard surgical shoe, restricting weight to the heel or lateral aspect of the foot. A randomized, prospective study of 61 cases found a 97% fusion rate for the early weightbearing group and a 93% fusion rate for the delayed weightbearing group, suggesting no difference in radiographic union or clinical outcome between patients who began ambulating two to four days post-operatively and those who remained non-weightbearing for four weeks. Most authors recommend the use of a post-operative shoe or a CAM boot to eliminate the propulsive phase of gait, thus decreasing the chance for fixation failure. Young and colleagues compared three types of post-operative boots with a fiberglass cast in a cadaver model using strain gauges in the first MTPJ joint and simulated weightbearing. They found that the removable cast boots provided the same, and in one type, even more reduction of force across the arthrodesis site than a traditional fiberglass cast. The exact amount of force that a first MTPJ arthrodesis site can tolerate before failing is still unknown. The authors recognize that in certain situations, the force to failure may be reduced, such as revision arthrodeses utilizing bone grafts, cases in which less than optimal fixation is achieved, or large patient habitus. In such cases, an early weightbearing protocol may not be appropriate. Further limitations of this case report include the small number of cases, selection and evaluation bias. The small number is due to the fact that all patients were directly seen by the junior authors. The senior author may have had other patient’s that would have satisfied the selection criteria, but were not included. This may have lead to an unintended selection bias. All patients and radiographs were evaluated by the senior author. Evaluation bias may have also occurred. The patients’ digital radiographs are included to address this concern. While the authors recognize these limitations, we do not advocate a change in the standard of care based solely on limited case studies alone and further studies are needed. The authors have presented 2 cases of early ambulation following first MTPJ arthrodesis with a successful result using a locking plate with an interfragmentary screw. This clinical report shows promise for first MTPJ with regard to early and immediate ambulation following first MTPJ fusions. 1. Yu GV, Shook, JE. Arthrodesis of the first metatarsophalangeal joint. Current recommendations. JAPMA 1994 84(6): 66-80. 2. Smith RW, Joanis TL, Maxwell PD. 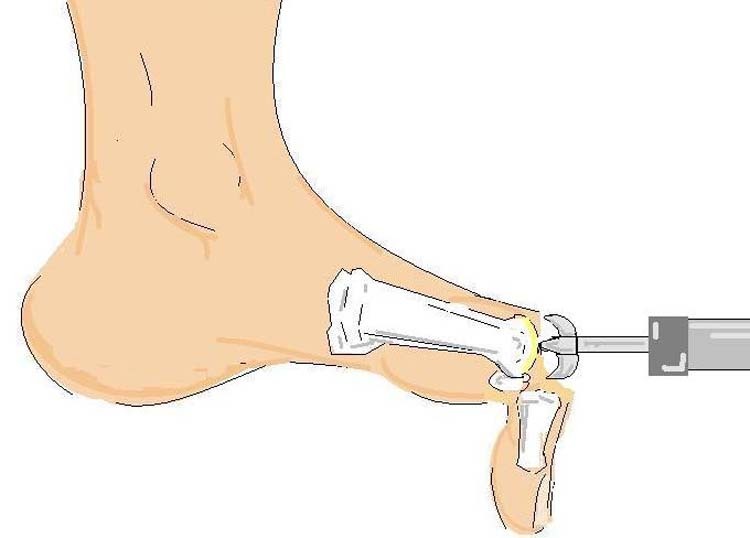 Great toe metatarsophalangeal joint arthrodesis: a user-friendly technique. 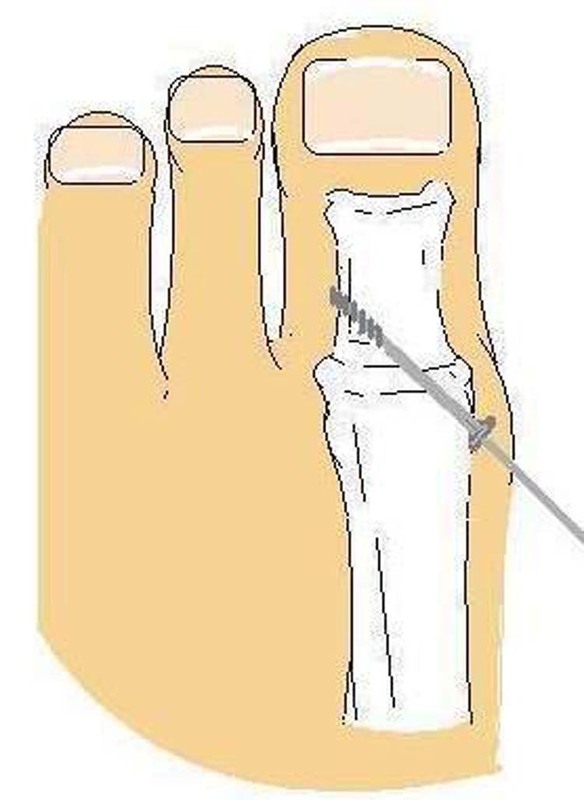 Foot Ankle 1992 13(7): 367-77.
method of fixation for first MTP joint arthrodesis. Foot Ankle Int 2001 22(8): 687-688. 5. McKeever DC. Arthrodesis of the first metatarsophalangeal joint for hallux valgus, hallux rigidus, and metatarsus primus varus. JBJS 1952 34A(1): 129-134. 6. Turan I, Lindgren U. Compression-screw arthrodesis of the first metatarsophalangeal joint of the foot. Clin Orthop Rel Res 987 (221): 292-295. 7. Harrison MHM, Harvey FJ. Arthrodesis of the first metatarsophalangeal joint for hallux valgus and ridigus. JBJS 1963 45A (3): 471-480. 8. Goucher NR, Coughlin MJ. 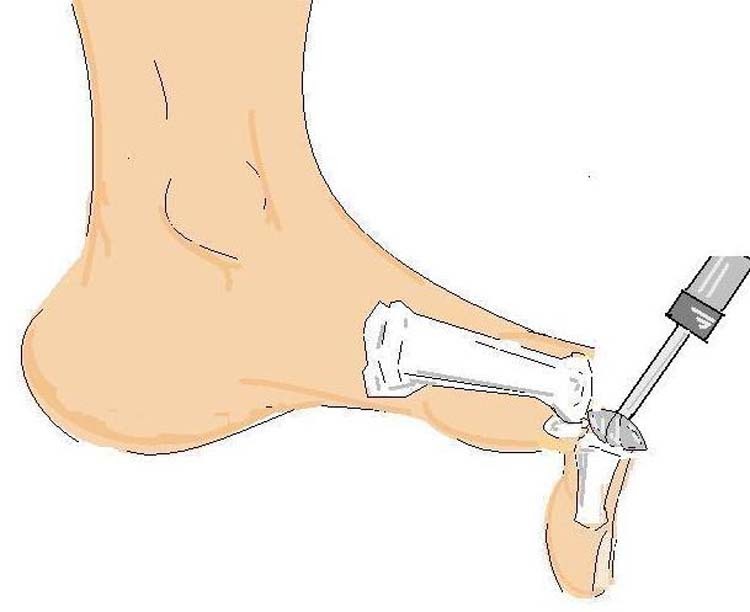 Hallux metatarsophalangeal joint arthrodesis using dome-shaped reamers and dorsal plate fixation: A prospective study. Foot Ankle Int 2006 27(11): 869-876. 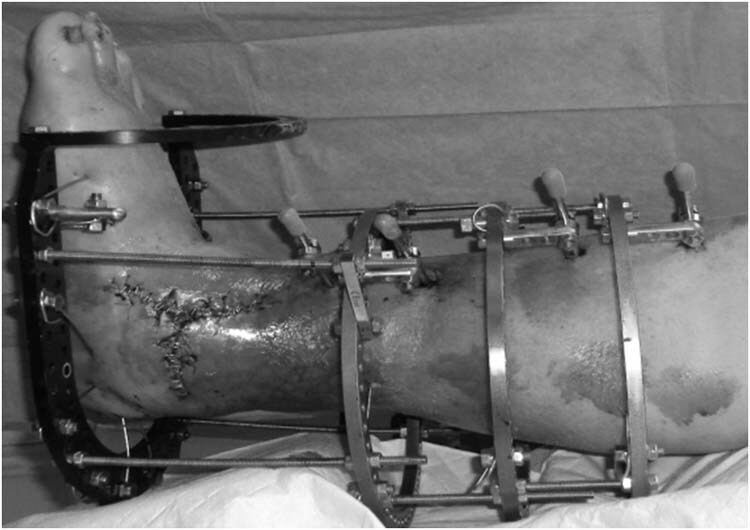 Metatarsophalangeal joint arthrodesis: a retrospective observational case analysis. 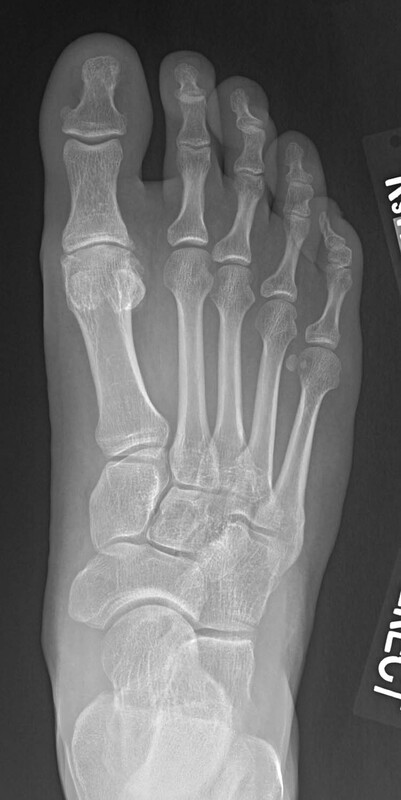 J Foot Ankle Surg 2004 43(3): 156-159.
first metatarsal phalangeal arthrodesis. 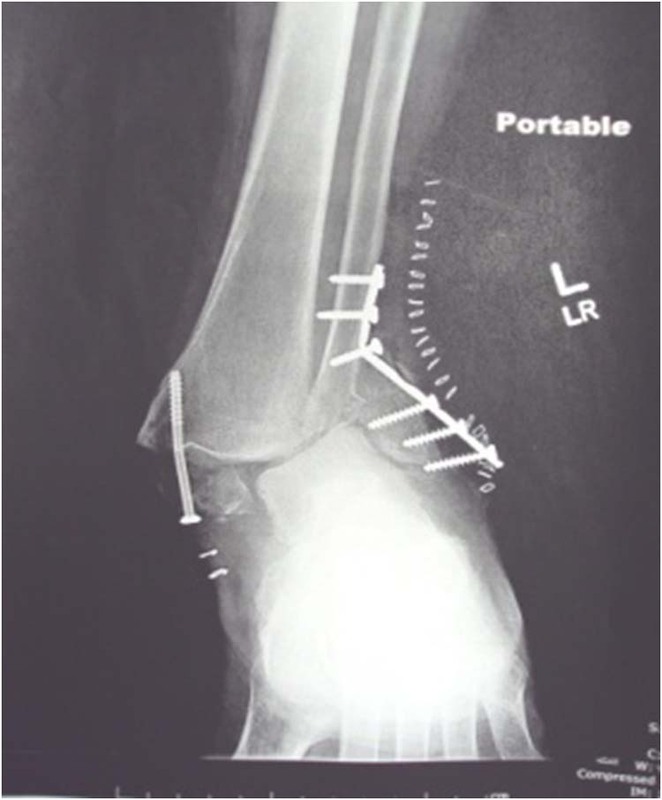 J Foot Ankle Surg 1997 36(6): 425-429 (discussion 467). metatarsophalangeal joint using a dorsal titanium contoured plate. 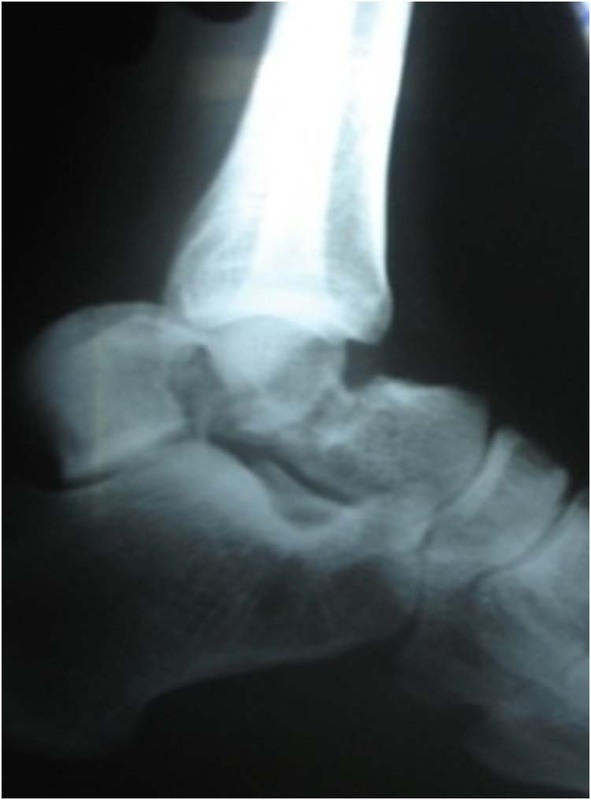 Foot Ankle Int 2004 25(11): 783-787.
after arthrodesis of the first metatarsophalangeal joint. A randomized study of 61 cases. Acta Orthop Scand, 1991 62(6): 544-555.
metatarsophalangeal joint as salvage for the failed Keller procedure. JBJS 1987 69A(1): 68-75. 14. Neufeld SK, Parks BG, Naseef GS, Melamed EA, Schon LC. Arthrodesis of the first metatarsophalangeal joint: a biomechanical study comparing memory compression staples, cannulated screws, and a dorsal plate. Foot Ankle Int 2002 23(2): 97-101. 15. 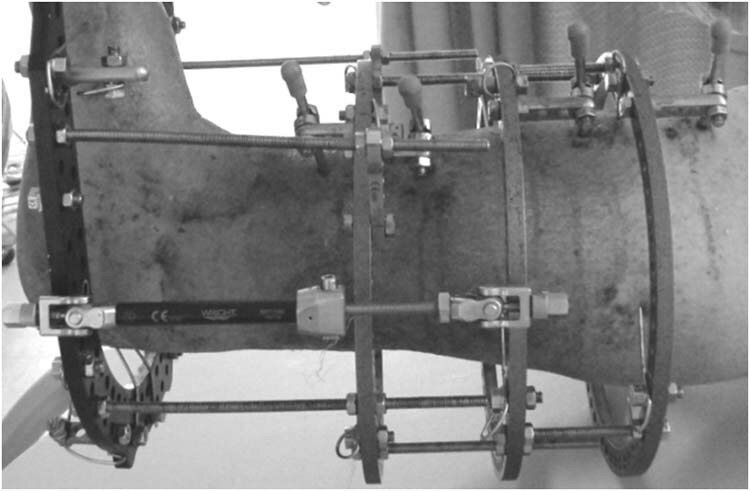 Curtis MJ, Myerson M, Jinnah RH, Cox QG, Alexander I. Arthrodesis of the first metatarsophalangeal joint: a biomechanical study of internal fixation techniques. Foot Ankle, 1993 14(7): 395-399. 16. Politi J, John H, Njus G, Bennett GL, Kay DB. 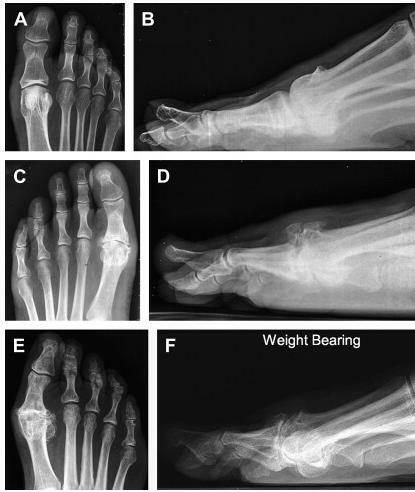 First metatarsal-phalangeal joint arthrodesis: A biomechanical assessment of stability. Foot Ankle Int 2003 24(4): 332-337. 17. Perren SM, Cordey J, Rahn BA, Goutier E, Schneider E. Early temporary porosis of bone induced by internal fixation implants. A reaction to necrosis, not to stress protection? Clin Orthop Rel Res 1988 (232): 139-151.
fractures. The scientific basis of biological internal fixation: choosing a new balance between stability and biology. JBJS 2002 84B (8): 1093-1110. 19. Müller ME, Allgoewer M, Schneider R, Willenegger H. Manual of internal fixation : techniques recommended by the AO-ASIF Group. 3rd Ed. 1991, Berlin ; New York: Springer-Verlag. xxviii, 750. 20. Rüedi TP, Murphy WM. AO principles of fracture management. 2000, Stuttgart ; New York; Davos Platz, [Switzerland]: Thieme; AO Pub. 864. 21. Wyss UP, McBride I, Murphy L, Cooke TD, Olney SJ. Joint reaction forces at the first MTP joint in a normal elderly population. J Biomech 1990 23(10): 977-984. 22. Kim T, Ayturk UM, Haskell A, Miclau T, Puttlitz CM. Fixation of osteoporotic distal fibula fractures: A biomechanical comparison of locking versus conventional plates. J Foot Ankle Surg 2007 46(1): 2-6. 23. Gallentine JW, Deorio JK, Deorio MJ. 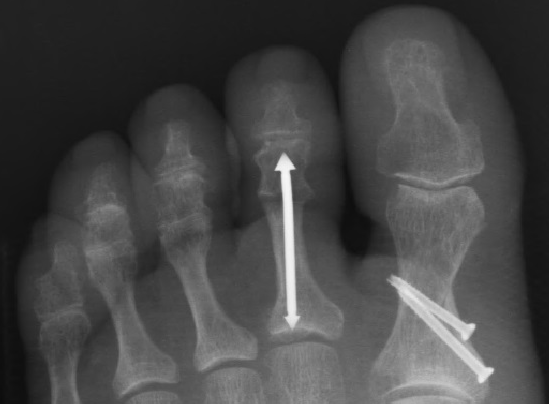 Bunion surgery using locking-plate fixation of proximal metatarsal chevron osteotomies. Foot Ankle Int 2007 28(3): 361-368. 24. Richter M, Gosling T, Zech S, Allami M, Geerling J, Droste P, Krettek C. A comparison of plates with and without locking screws in a calcaneal fracture model. Foot Ankle Int 2005 26(4): 309-319.
compared to H-locking plate fixation for first metatarsocuneiform arthrodesis: a biomechanical study. Foot Ankle Int 2005 26(11): 984-989. Foot and Ankle. 8th Edition. 2007, Philadelphia: Mosby. used in the early postoperative period after first metatarsophalangeal joint arthrodesis. Can J Surg 2003 46(3): 183-186. Address correspondence to: Robert M. Greenhagen, DPM, UPMC Podiatric Residency Program, Pittsburgh, PA. The author presents a case report of an attempted arthrodesis of the first metatarsophalangeal joint in a patient with rheumatoid arthritis. Reasons for non union were explored. These include the primary disease process and associated medical and surgical complications. There is conflicting data regarding any direct correlation of patients with rheumatoid arthritis and ethnicity affecting the outcome of surgical arthrodesis. Rheumatoid arthritis (RA) affects people worldwide with a consistent prevalence of 1%. It is most prevalent in highly developed countries such as the United States, England, and Scandinavia. The prevalence of the disease varies in some populations, and may exceed 5% in several Native American tribes such as the Yakima, Chippewa and Pima tribes of the United States. [1,2] In contrast, RA is less common in Japan and Hong Kong and relatively rare in Indonesia and sub-Saharan Africa. This case report illustrates a surgical non union 8 months following an arthrodesis procedure in a patient with rheumatoid arthritis. A 35 year old female with a history of rheumatoid arthritis presented to the podiatry clinic with a chief complaint of pain in the right great toe for the previous 6 months. Her systemic disease was adequately controlled by her primary physician with Etanercept (Enbrel®), 25 mg injected subcutaneously twice per week. The patient was also taking Alendronate (Foxamax®)70mg by mouth weekly. We also prescribed naproxen, 500 mg twice per day, and hydrocodone, 5mg with acetaminophen 500 mg as needed for breakthrough pain. The patient’s primary provider also prescribed a baseline daily dose of prednisone, 10 mg daily, in addition to an increase, then tapering schedule with an endpoint of 20 mg daily. The patient is a non-smoker and did not have diabetes or peripheral neuropathy. Medical treatment failed to provide pain relief, and shoe therapy combined with corticosteroid arthrocentesis was recommended. The patient’s symptoms progressed and she was presented with several surgical options. The patient underwent a first MTP arthrodesis procedure using the CHARLOTTE™ MTP Fusion System (Wright Medical Technology, Inc.). The surgery was uneventful, and radiographs taken 7 weeks postoperatively demonstrate adequate correction (Figs 1, 2). 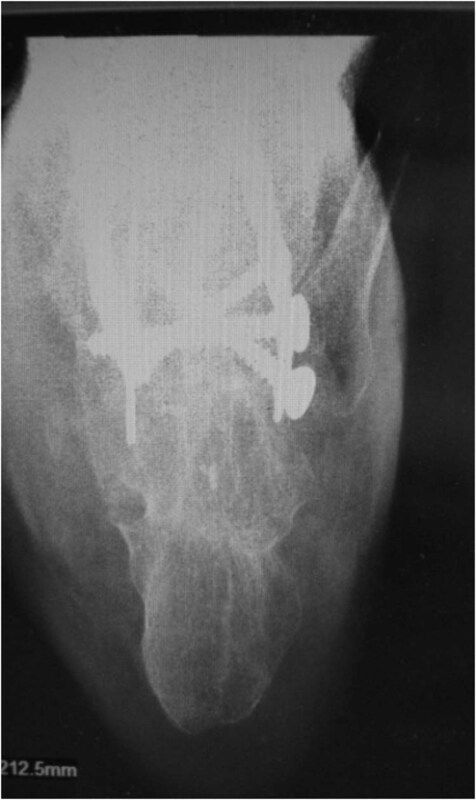 Figure 1 The 7 week postoperative anteroposterior radiograph demonstrating satisfactory placement of the CHARLOTTE™ MTP plate with screw fixation. The CHARLOTTE™ Multi-Use Compression screw is also visible from medial distal to lateral proximal. 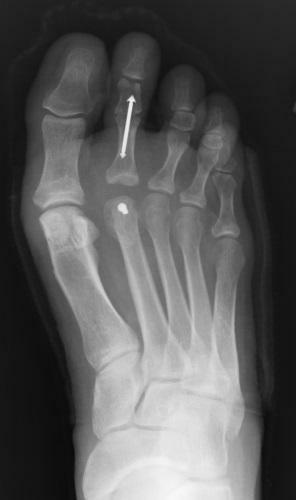 Figure 2 The 7 week postoperative lateral radiograph illustrating the low profile of the construct, with good purchase of all screw threads. The patient was kept immobilized for 3 months, ambulating in a cam walker for that entire time, and was subsequently discharged from postoperative care. Shortly after discharge, the patient relocated to another city in Montana. 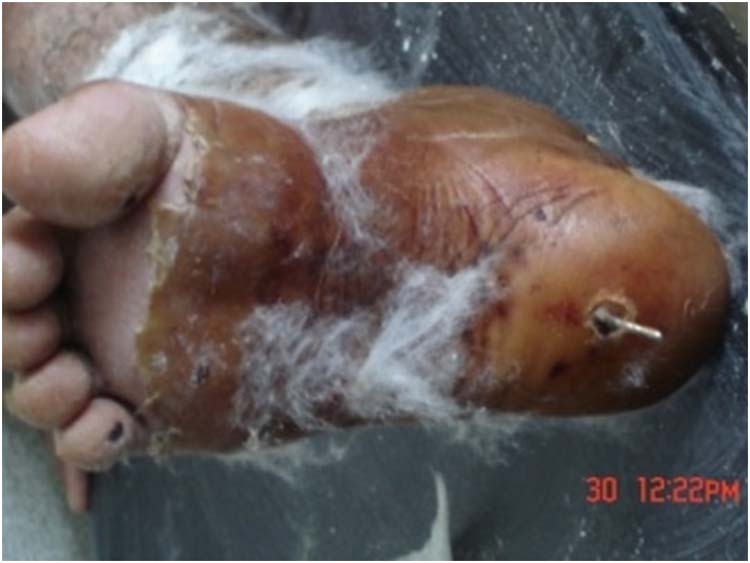 The patient returned to the podiatry clinic 8 months later with a screw head percutaneously visible. There were no complaints of pain other than the concern over a visible screw head and associated dorsal edema. There was no reported history of trauma to the affected foot during the intervening time. Subsequent radiographs demonstrated loosening of the other screws and a failed union of the first MTP joint (Figs 3, 4). 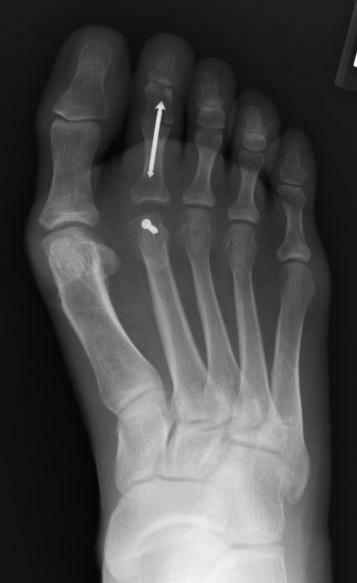 Figure 3 The 8 month postoperative anteroposterior radiograph clearly showing the non union, exuberant bone medial to the plate, and lucency of bone around the screws. 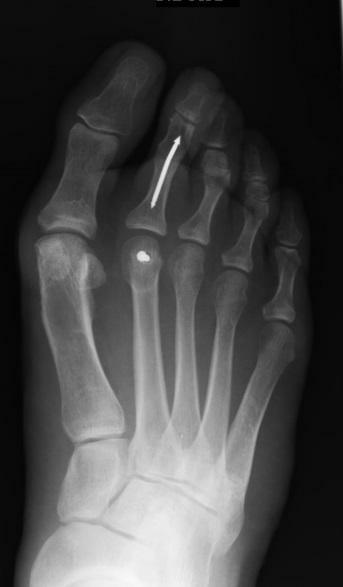 Figure 4 The 8 month postoperative lateral radiograph demonstrating the position of the percutaneous screw and loosening of the entire construct. The dorsal edema and visible screw head prompted the patient to return to the clinic. The percutaneous screw was easily removed in the clinic with a hemostat. The patient returned to the operating room where all hardware was removed except for the initial transverse screw. The region of the non union and first metatarsal shaft was remodeled with demineralized bone matrix using Allomatrix® DR (Wright Medical Technology, Inc.). This was applied within the pseudo joint space along with another CHARLOTTE™ Multi-Use Compression screw. An Orthofix bone growth stimulator was fitted and dispensed to promote bone healing. Radiographs taken prior to the author’s relocation indicated adequate progression of primary bone healing of the revised surgical site. The incidence of non union following arthrodesis of painfully diseased joints in rheumatoid arthritis patients is not unusual. [3,4] However, there is conflicting data suggesting a direct correlation between RA and surgical non union. [9,10] Maenpaa et al  state that non unions are more common among patients with severe deformity and osteoporosis (RA, neuromuscular arthropathy). In contradiction to the previous statement, Bogoch and Moran  state that the relatively rapid and reliable bone healing and arthrodesis in RA may be attributable to the preexisting rapid turnover of bone with an increase in osteogenesis. These authors speculate that the phase of induction of osteogenesis initiated by surgical arthrodesis is enhanced by the preconditioned state of bone formation in this patient group. Other possible primary surgical approaches to consider in this case were hemi or total first implant arthroplasty verses resection arthroplasty (Keller procedure). This patient desired a rigid fusion. Another approach to revision could have been to remove all hardware and leave the non union alone, since she had no pain. Some studies show that non unions are not always painful. If successful, first MTP arthrodesis is a satisfactory procedure with good long-term results. [5,6] The effects of poor bone healing with the use of oral prednisone are widely recognized. This may be considered a causative factor in this surgical result, but is purely speculative. The effect of an intra-articular corticosteroid injection in the final result of this case is also unknown. It is unlikely that joint injection with corticosteroid would have such a widespread effect on the massive failure of the entire construct. What is known is the increased risk of non union due to the patient’s comorbidity of rheumatoid arthritis. The literature [1,2] supports the notion that the incidence of rheumatoid arthritis in certain Native American tribes exceeds 5%. While this author could not locate a specific reference to the incidence of RA in the Blackfeet Tribe of Montana, obeservations by two family doctors on this reservation over a 20 year period concur a similar incidence of the disease in the Blackfeet members they have treated. The pharmacy budget at the Blackfeet Community Hospital is significantly impacted by the cost of RA mitigating drugs. In addition to medical morbidities, the foot and ankle surgeon must recognize rheumatoid arthritis as a factor that may impact the outcome of planned surgical procedures. High risk patients should be adequately counseled regarding risk factors and benefits verses possible adverse results. This should be carefully considered during the informed consent process. There seems to be a general consensus among foot and ankle surgeons that patients with RA have a higher risk of non union following surgical arthrodesis. The possibility of the increased risk of non union associated with RA in conjunction with ethnic ancestry cannot be positively correlated by this report and may merit further study of bone healing and genetic background. 1. Cush, JJ, Kavanaugh, A. Rheumatoid Arthritis: Early Diagnosis and Treatment. Professional Communications, Inc., p 29. 2005. 2. Peschken, CA, Esdaile, JM. Rheumatic diseases in North America’s indigenous peoples. Seminars in Arthritis and Rheumatism 28 (6), pp.368-391. 1999. 3. 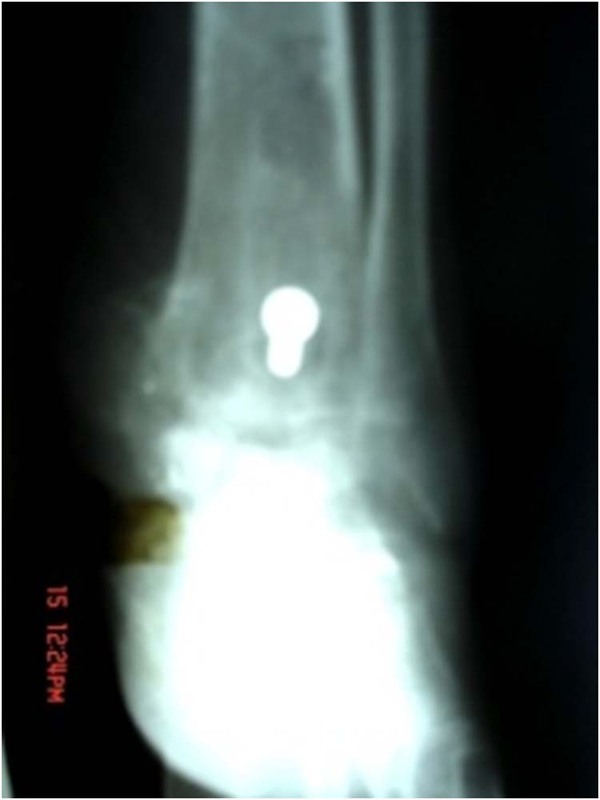 Anderson, T, Maxander, P, Rydholm, U, Besjakov, J, Carlsson, A. Ankle arthrodesis by compression screws in rheumatoid arthritis: Primary nonunion in 9/35 patients. Acta Orthopaedica 76 (6), pp. 884-890. 2005. 4. Salai, M, Hakerem, D, Pritch, M, Chechick, A, Goshen, E. Non-union of undisplaced radial neck fracture in a rheumatoid patient. Archives of Orthopaedic and Trauma Surgery 119 (1-2), pp.119-120. 1999. 5. Goucher, NR, Coughlin, MJ. 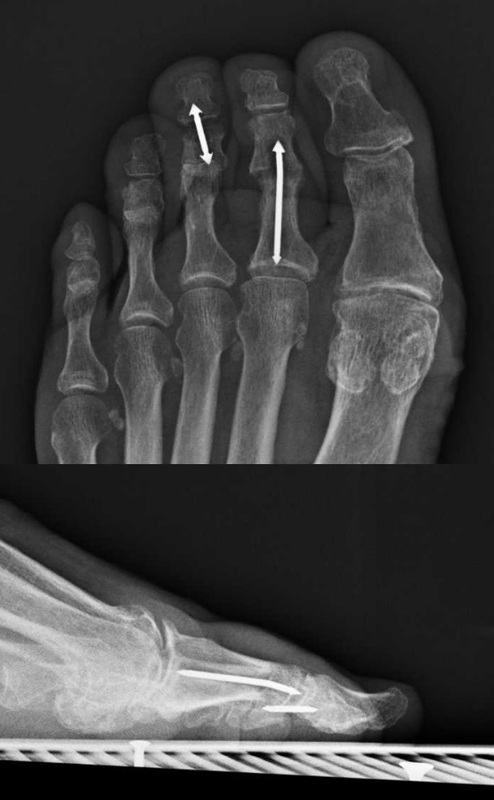 Hallux Metatarsophalangeal joint Arthrodesis using dome-shaped reamers and dorsal plate fixation: A prospective study. Foot and Ankle International 27 (11), pp. 869-876. 2006. 6. 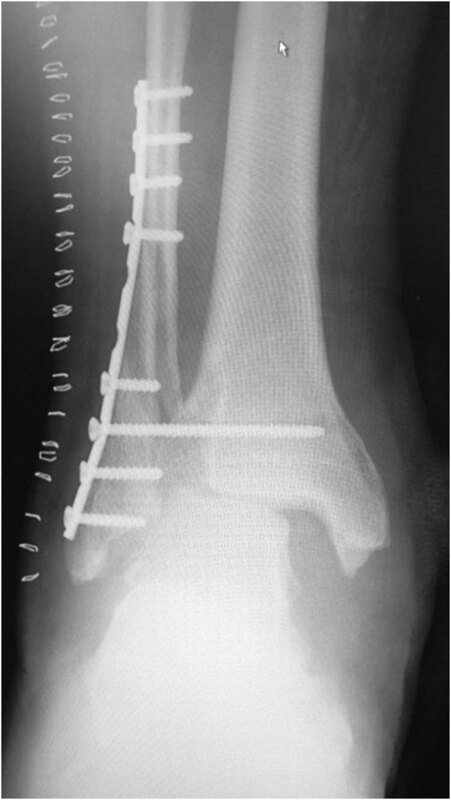 Brodsky, JW, Passmore, RN, Pollo, FE, Shabat, S. Functional outcome of Arthrodesis of the first metatarsalphalangeal joint using parallel screw fixation. Foot and Ankle International 26 (2), pp. 140-146. 2005. 7. Waters, RV, Gamradt, SC, Asnis, P, Vickery, BH, Avnur, Z, Hill, E, Bostrom, MPG. Systemic corticosteroids inhibit bone healing in a rabbit ulnar osteotomy model. Acta Orthopaedica Scandinavica 71 (3), pp. 316-321. 2000. 8. Personal communication, R. Rottenbiller, MD and R. Odegaard, MD. Blackfeet Community Hospital, Browning, Montana. 2007. 9. Maenpaa, H, Lehto, MUK, Belt, EA. Why Do Ankle Arthrodeses Fail in Patients with Rheumatic Disease? Foot & Ankle International 22 (5), pp403-408. 2001. 10. Bogoch, ER, Moran, EL. Bone Abnormalities in the Surgical Treatment of Patients with Rheumatoid Arthritis. Clin. Orthop., 366, pp8-21. 1999.